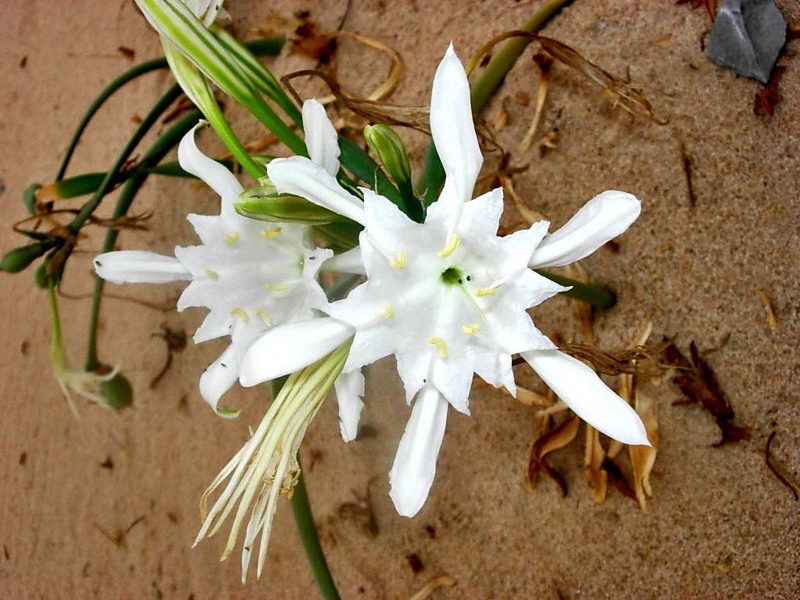 In Greek mythology, the Asphodel is one of the most famous of the plants connected with the dead and the underworld: the Asphodel Meadows is a section of the ancient Greek underworld where ordinary souls were sent to live after death. The Oxford English Dictionary gives Homer as the source for the English poetic tradition of describing the meadows of the afterlife as being covered in Asphodel. The flower has been referenced by many romantic post-Renaissance poets including Milton, Tennyson, Longfellow and even more recently, Leonard Cohen. 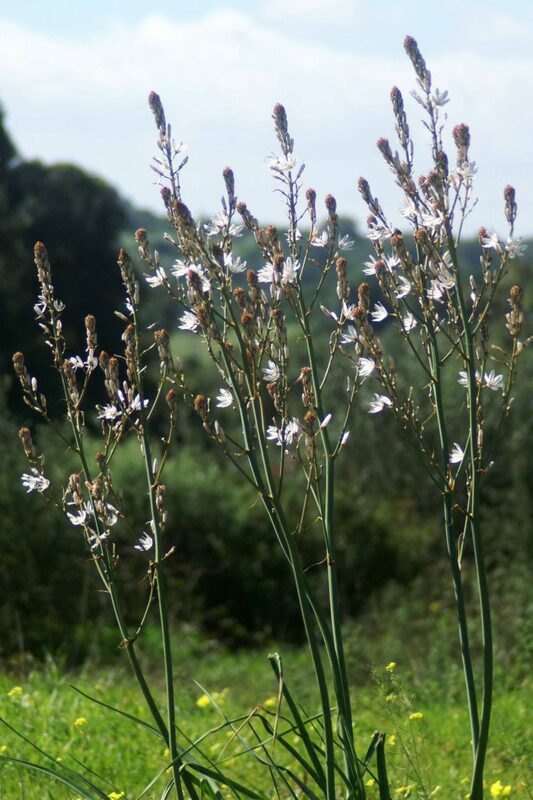 Members of the lily family, Asphodels are tall elegant but robust plants with tuberous roots and leafless stems rising above tufts of leaves that are long flat and narrow and taper to a point. 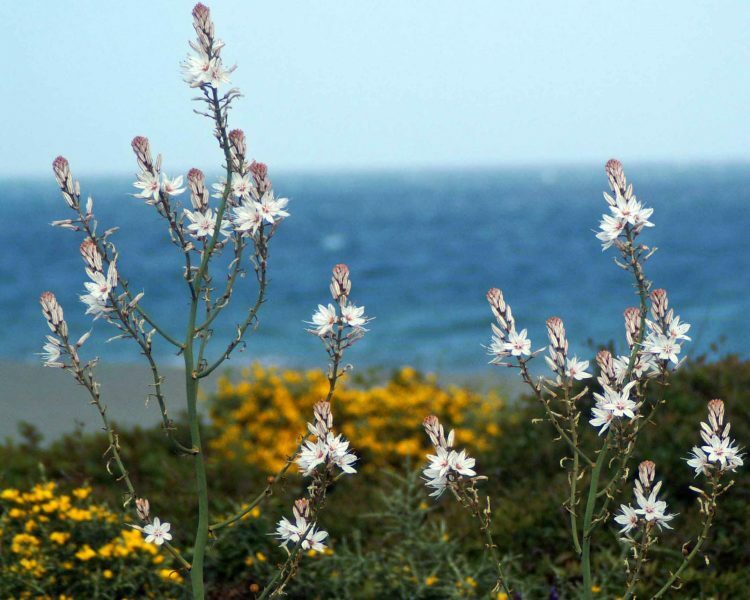 The flowers are starry and white There are several species that look similar to one another, but in Southern Spain and Gibraltar the two most likely to be seen are the Common Asphodel and the White Asphodel. 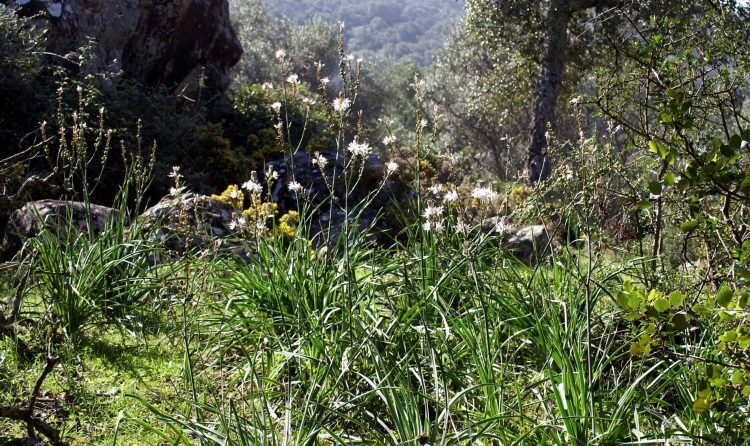 Mainly a lowland plant, the Common Asphodel can be found in a range of habitats including coastal, light woodland, roadsides, rocky slopes and garrigue. A medium to tall plant that often reaches up to 1m high. It has tuberous roots, which provide a firm anchor and store moisture. The leaves are long flat and strap-like, keeled beneath, 12-30mm wide and grey- green in colour. The flowers are held in a much-branched inflorescence that puts me in mind of a slightly wonky candelabra; individual flowers are star-shaped, white and has 6 petals, or tepals, each striped with a pinky brown midvein. Fruit is a small oblong capsule, less than 1cm across. One of my all-time favourite sights of Common Asphodel is this one taken at El Faro, Alcaidesa where the background is of gloriously scented golden gorse, blue sky and an even bluer Mediterranean Sea. Common Asphodel can sometimes be seen covering large areas of open uncultivated fields. It’s unpalatable to animals, which graze around and between the plants; spot the cow doing just that in the left of the photograph below. 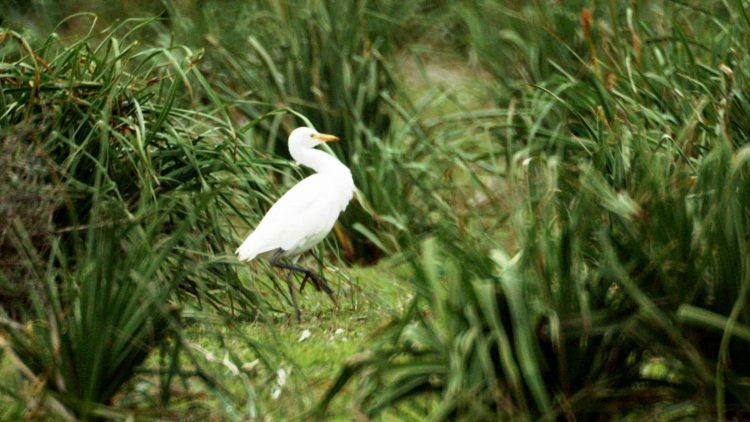 I love this glimpse I got of a Cattle Egret tiptoeing stealthily through the forest of leaves. 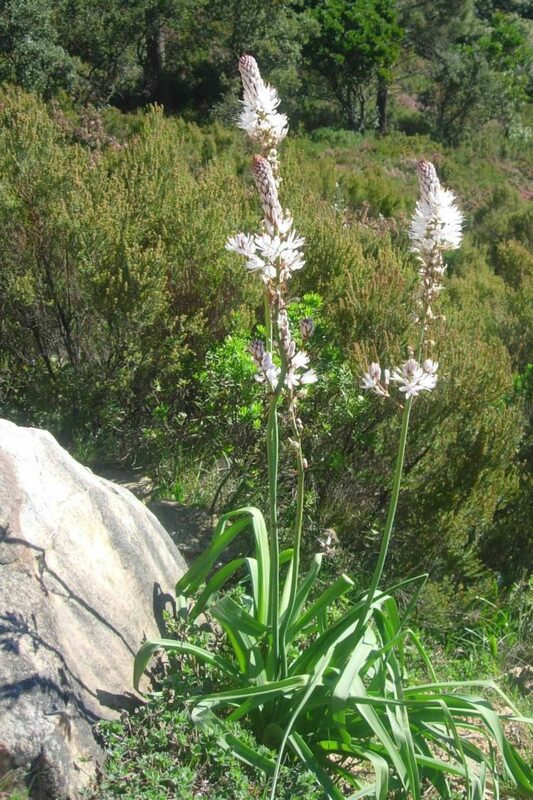 The White Asphodel also grows in a variety of habitats, in seasonally damp places, open woodland, meadows at low altitudes and is commonest in the hills and mountains. 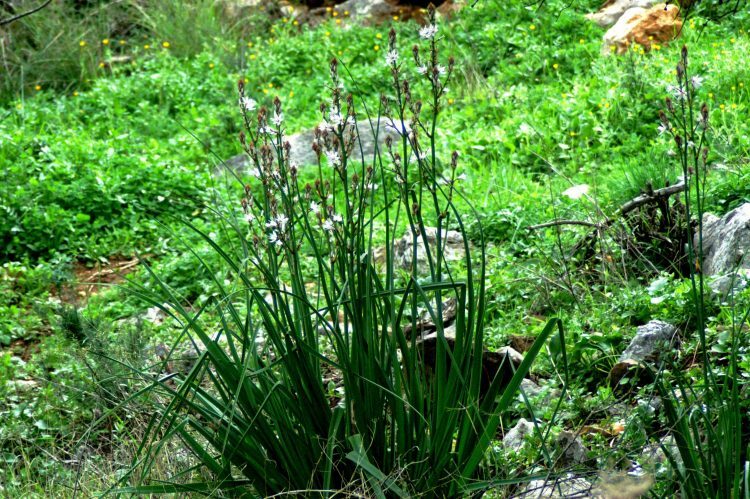 Similar in stature to the Common Asphodel, White Asphodel also reaches heights of up to 1 metre tall and has tuberous roots. The leaves are basal, linear, slightly grey-green, channelled and taper to a point at the tip. The flowers are borne in a dense, simple spike-like raceme; individual buds have a narrow brown midvein which may be less marked on the starry white petals; bracts are usually dark brown. Fruits are almost round capsules. I took my first photographs of this striking plant toward the end of a memorable walk around El Cabrito mountain. 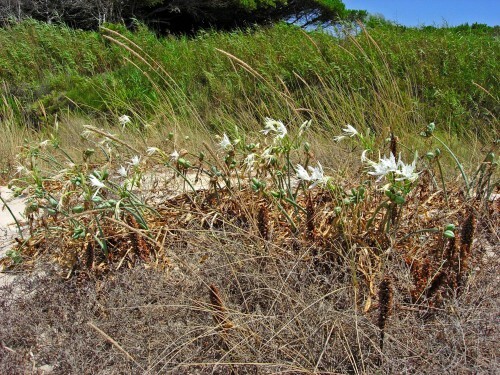 It was growing on the edge of a made track, bright sunshine cast the plant’s shadow onto the adjacent rock and also made it tricky to get a clear image of the bright white flowers. Thankfully the varied greens of heather and pine trees in the background helped the flower spikes stand out. We came upon it again on El Bujeo mountain, which neighbours El Cabrito but has a different aspect and character. Here it was growing in a damp grassy clearing in front of a Rhododendron shrub. And here it is in the forefront of this amazing view from the summit, which looks down over the busy port town of Algeciras and across the Bay to Gibraltar. I took this photograph way back in 2005 since when there has been a lot of development and construction on both the Spanish mainland and on Gibraltar itself, but I’m sure the view remains stunning. The leaves are used to wrap burrata, an Italian cheese. The leaves and the cheese last about the same time, three or four days, so fresh leaves are a sign of a fresh cheese, while dried out leaves indicate that the cheese is past its best. Although left alone by animals, the starchy tubers are just about edible by people and are known to have been used as food by poorer people, in times of hardship and need; hence such food was thought good enough for the slaves. 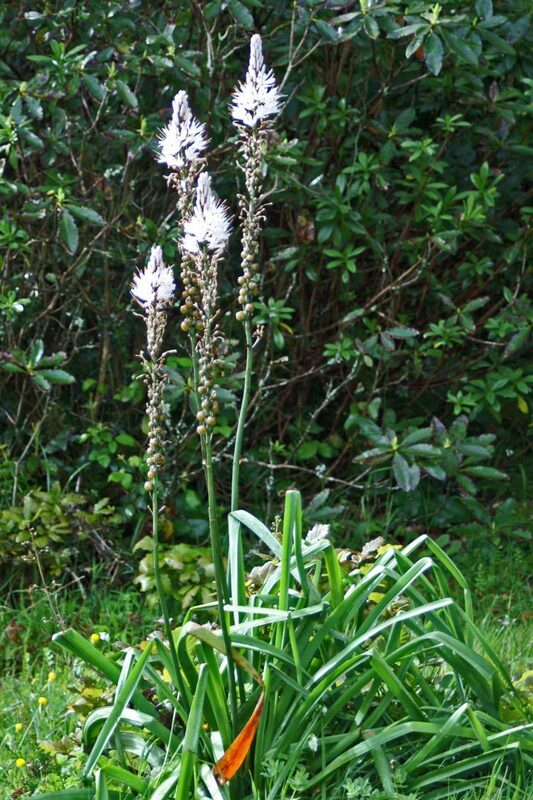 Medicinally the Asphodel was supposedly a remedy for poisonous snake-bites and a specific against sorcery; it was fatal to mice, but preserved pigs from disease. Libyan nomads made their huts of asphodel stalks. Photographs: All my own work! I can hardly believe it’s been a year since I was enjoying the Spring in Gibraltar; how time flies! Here in North Wales this afternoon the temperature is 9C, it’s windy and the humidity 76% – rain was predicted but so far has missed us. The BBC tells me it is 16C and the humidity 44% in Gibraltar, about the same as it was a year ago but it would seem not as windy as it was then. To cheer myself up while waiting for our Spring to arrive I thought I’d take a virtual trip back there recalling the spectacular walk I took on the Upper Rock on this day a year ago. I hope you enjoy it as much as I did. Early morning and we were back at the Bird Observatory at Jew’s Gate on the Upper Rock. As on previous days the wind blowing from the north was still preventing returning birds from travelling this way: a little disappointing, but I had other plans for the day and was keen to get going. I was going to take a walk along the Mediterranean Steps path. It’s a challenging trail, about 1.5km long and as it warns in the name, quite a bit of it involves climbing steps. It’s not recommended for anyone of faint heart or with vertigo, but if you are fairly fit it is more than worth the effort. The views are truly spectacular, there are some rather special birds you may be lucky enough to catch a glimpse of, but for me it’s mostly about the wonderful array of wildflowers that flourish here, many of which are at their best in the Spring. 11:30 Once on the path the bulk of the Rock gave complete shelter from the wind and it was warm and sunny, perfect conditions for my style of walking – leisurely ambling punctuated with frequent stops to take photographs. From the outset there were plants to stop and look at. Many were familiar to me but I hadn’t seen them for a few years and already they were bringing back happy memories. This walk was going to occupy me for some hours to come! Bear’s Breech, Acanthus mollis was the first plant to catch my eye. Often valued as a garden plant, in the wild it spreads like wildfire to the detriment of other more desirable native plants, and is all too common in all habitats throughout the Rock. The plant’s strikingly handsome leaves were often replicated as architectural embellishments, particularly around the capitals of Corinthian columns. Then Butcher’s Broom with large red berries that intriguingly sit in the centre of the thick leathery leaves. The plant is so-called as the stiff stems were tied together to make a broom or brush; perhaps especially favoured by butchers for sweeping the sawdust from their shop floors. The leaves of the plant twining around the stems of the Butcher’s Broom belong to the Pipe Vine, also known as Dutchman’s Pipe both names due to the shape of its flowers. Nearby another climbing/twining plant had reached its way to the top of a shrub. This was Rough Smilax, a harsh name for a plant I think is rather attractive with its glossy heart-shaped leaves that are red-bronze when new. It may be so-called as the stems are equipped with hooked spines to aid climbing. A member of the lily family, Common asphodel will have been flowering for a while now and is developing fruits. The bright lime green-yellow of Spurge provide the perfect background to the blue of this gorgeous Giant Squill. The dramatic Giant Squill flowers are past their best now, but still look good to me. The lovely Spurge is Warty Spurge, so-called as its fruit capsules are covered in rough little bumps that clearly made someone think of warts. To begin with the vegetation on either side of the path is quite dense perfectly suiting a Sardinian warbler that was making its way along through the shrubbery, he popped out every now and then but not for long enough to photograph. Soon the vegetation thinned and opened up the spectacular view that demanded to be admired; I was happy to oblige. The North African coast, just 12 miles (14km) away across the Strait was obscured by mist today: when it’s clearer the mountain of Jebel Musa and the town of Ceuta which is 5km to the south of it, are easily visible. Down below is Europa Point; the Mosque is visible in the far left corner of the photograph. The path is narrow and uneven with loose stones and exposed rocks, another reason to take it slowly! It is bordered with lush dense vegetation, much of which is evergreen, tough and perfectly adapted in a variety of ways to survive and thrive in the harsh conditions it is exposed to year round. It’s quiet and peaceful here for much of the time, the hustle and bustle and noise of the town could be a million miles away from here. It’s not silent though: the accompanying sounds of gulls are almost constant and can get rather raucous at times. Hundreds of Yellow-legged gulls populate Gibraltar and you can’t go far without encountering one or two. As with their northern cousins, the similar-looking Herring gulls they are not well-loved by many. 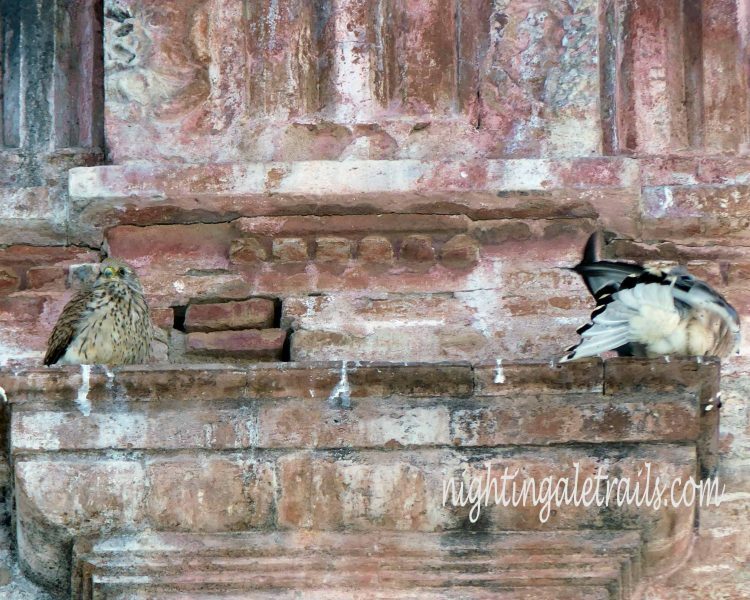 They mercilessly mob migrating raptors which they perceive as potential threats to their young and of course they have to be kept at bay from the airfield. 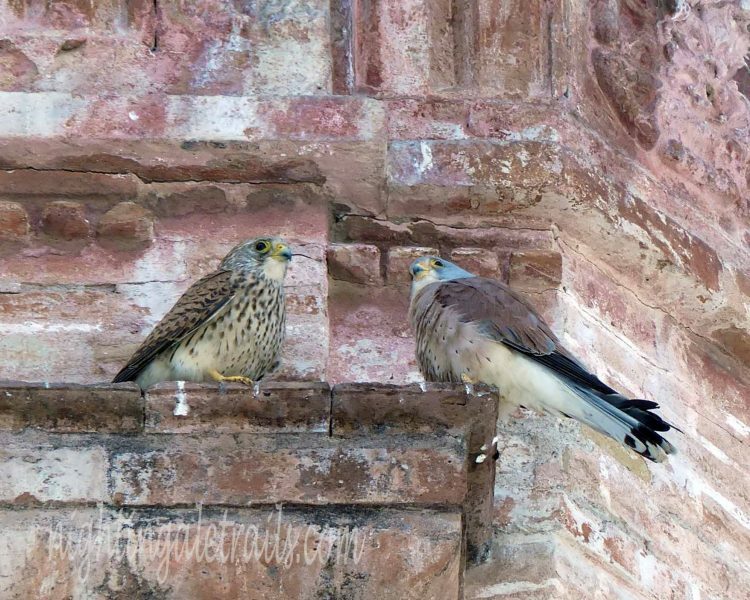 Seen closely and in a wilder habitat you can’t deny they are handsome and characterful birds though, can you? At the side of the path this pair of gulls were using the wall as a look-out post. They probably have a nest-site staked out close by and there’s a lot of competition for good nesting sites here. Below me a squadron of gulls appeared relaxed, but doubtless at least a few of them were on look-out for potential aerial threats or interlopers, including any passing migrant raptors; it would take very little to launch them squawking into the air. 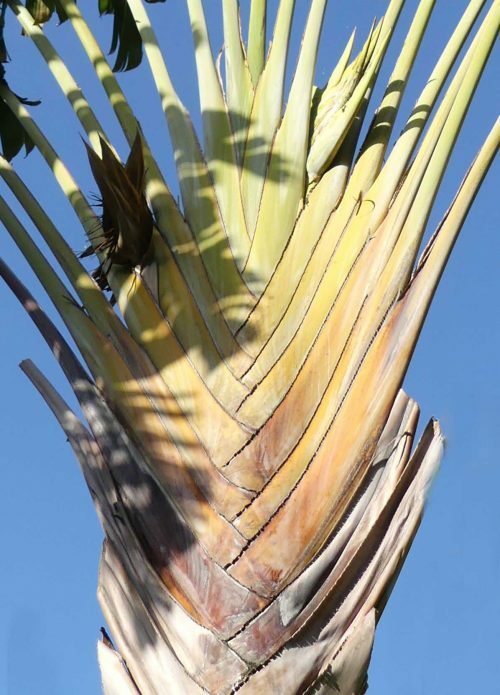 The Dwarf Fan Palm is the only palm native to Europe. Common throughout the Rock, their dramatic architectural fronds bring a touch of the exotic to the vegetation. Although much of the vegetation is tough and hardy, for a few short weeks an array of more delicate-looking wildflowers have their chance to flower and set seed before the heat of the sun because too intense and the summer drought sets in. There is Rose Garlic, seen here growing through leaves of the Giant Tangier Fennel and the dainty Greater Soft Storksbill. Blue Pimpernel, the southern version of our Scarlet Pimpernel is one of my favourites. I caught a Bee-fly taking nectar from a little yellow flower I didn’t know, but later found it to be Succowia, which is a member of the mustard/cabbage family. There were two pretty bindweeds; the Small blue convolvulus was a lucky spot as it’s really more tiny than small. The larger Mallow-leaved bindweed with pink flowers is more noticeable. There are some scenes you walk into which would be my idea of the perfect Mediterranean garden. Here there is Wild Olive, Osyris, Dwarf Fan palm, Spurge, Scorpion vetch, Tree germander and more filling every available inch of space. Tree or Shrubby germander is another shrub often cultivated in gardens. It’s a lovely shrub with pretty flowers much loved by bees and much tougher than it looks. 12:10 already and I’d made hardly any progress, there had been so much to see. This stop was to savour the delicious scent of the golden broom. Nearby, a similar looking but smaller and softer shrub is also fragrant; Shrubby Scorpion vetch. It takes its common name from its seedpods – they are …. and resemble a Scorpion. I think its Latin name Coronilla valentina is much prettier. My eyes were drawn upwards where a great number of Yellow-legged gulls were up in the air circling and making a tremendous racket. 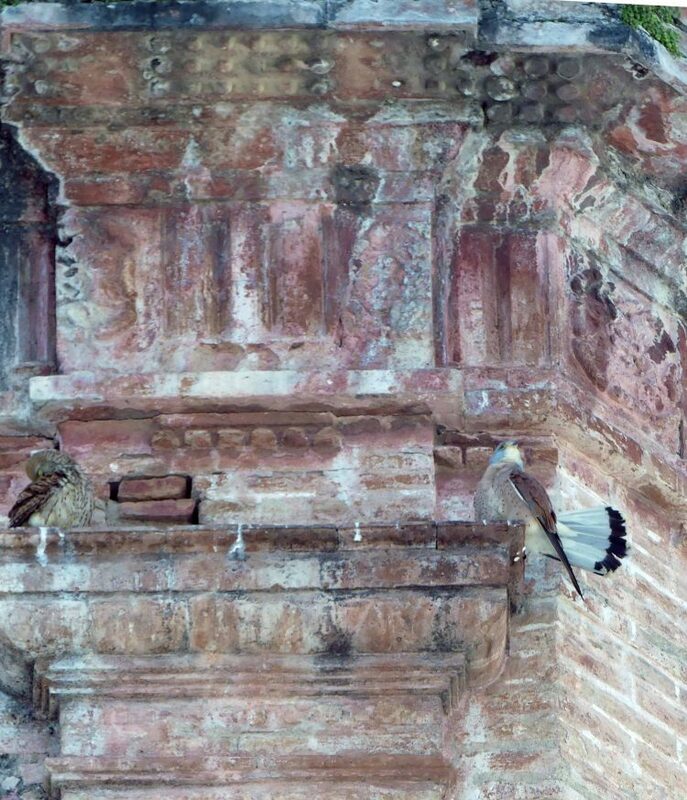 Every white spot in my photograph is a bird, not dust on the lens! A single gull looked out from a rock outcrop above me. 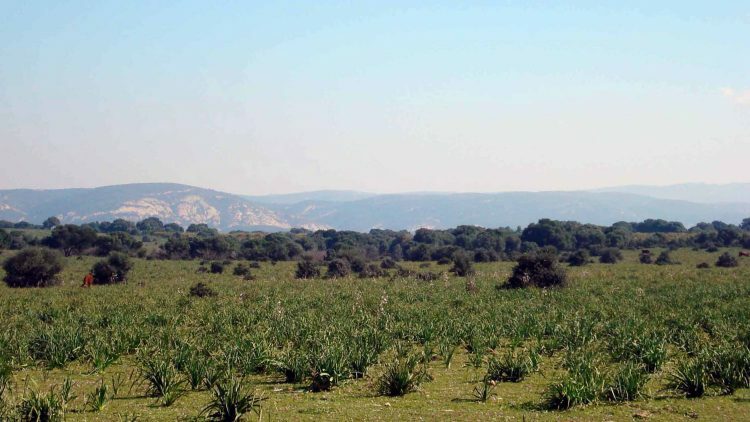 A significant plant I haven’t mentioned yet is the Giant Tangier Fennel – a wonderfully architectural plant that towers over your head and leans in to frame many a view out to sea. 12:15 – I reached the section of the path where steps lead down the cliff a way- this bit needs a bit of care and attention as to where you’re putting your feet. I’d been watching out for butterflies and finally saw some here. 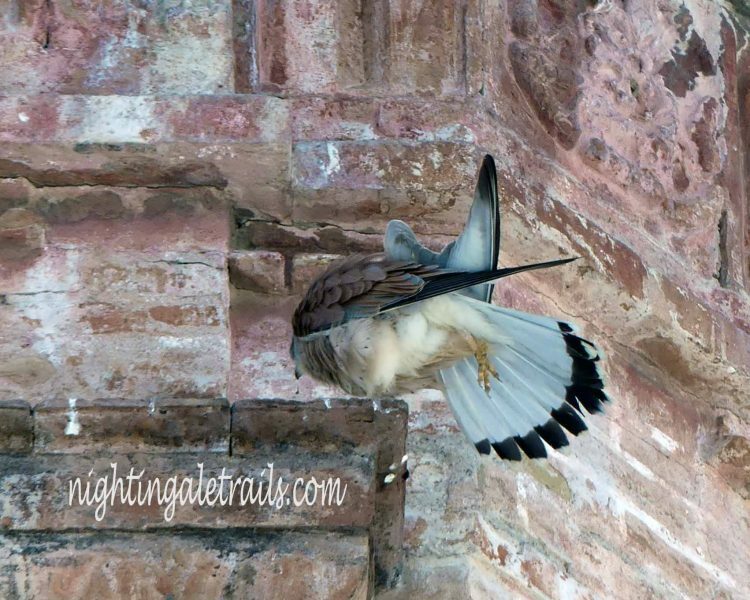 There was a beautiful male Cleopatra flying back and forth constantly; as is their wont, he didn’t settle at all. More obliging was one of several equally lovely Spanish Festoons. It was flitting from plant to plant, I don’t know why, I wondered if it was a female ovipositing, then at one point it seemed to be sucking up honeydew from clematis leaves. In the foreground of the larger image is the back of the Pink Mediterranean Catchfly-Silene colorata. This pretty little plant only opens its flowers completely from evening-time to the early morning. Many plants find a home in fissures of the limestone cliff, in this group are Sea daisies, Wall helichrysum & Giant squill. On the stony ground below was Rough bugloss. Behind it at the foot of the cliff a large Dwarf Fan palm backs Giant fennel and a patch of Alexanders. 12:47 I had still only reached the bottom of the steep steps that lead up to Martin’s Cave, where a board gives more information about The Upper Rock’s Varied Wildlife. 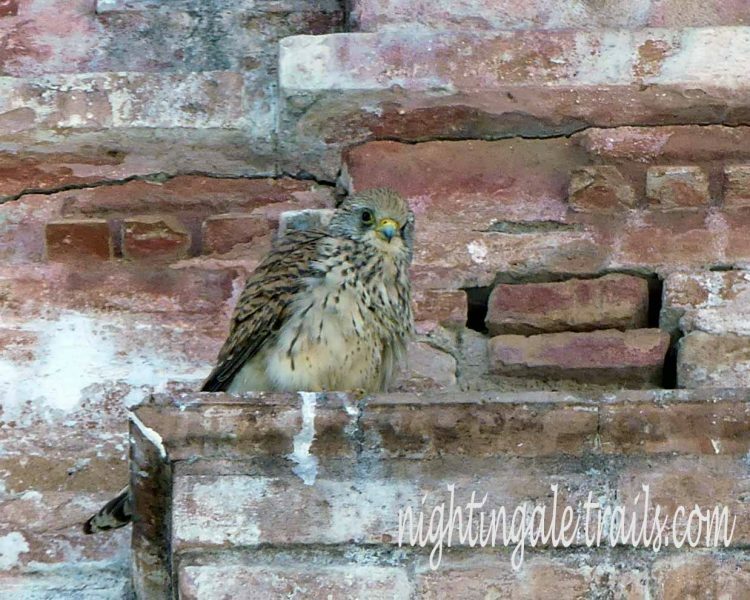 I would have liked to have seen a few more birds, especially a Barbary partridge or a Blue Rock thrush, but this is not the best time of day to see them and also I’d met or been overtaken by quite a few people which would have sent them into cover too. The flowers have more than compensated for their lack. 12:52 – First stop to look back at the way I’d just walked around the edge of the cliffs. On the approach to the cave I’d spotted some busy bees and wasps. A Paper wasp (polistes sp.) on Alexanders looked as though it may have successfully hunted and was eating something. I found Tree Mallow here, the Common Mallow I’d photographed a bit earlier below the steps. 13:02 I had stopped in front of the cave for a lunch break and just to sit and admire the view and watch what was going on around me. I didn’t sit still for long as I saw or heard things that caught my attention. A little wasp, a potter or a mason, was busy collecting earth which it would make into building material for a container in which to lay eggs. I heard Wrens singing from a couple of spots nearby but try as I might I couldn’t see one. 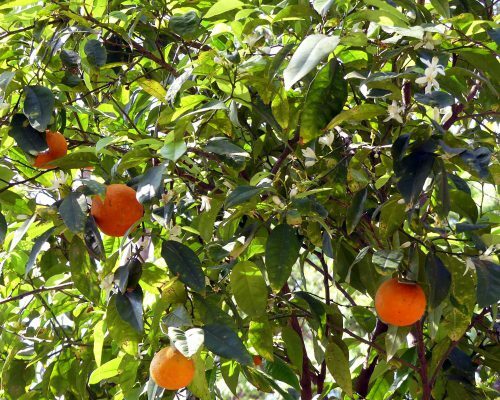 13:36 An Osyris shrub with orange fruits. There’s a lot of Bermuda Buttercup up here. Also known as Cape Sorrel, it is another invasive ‘alien’ that spreads rapidly, particularly where ground has been disturbed, but it doesn’t seem to do any damage to native plants and it’s a great source of nectar for insects through several months early in the year. A Squirting Cucumber plant was growing from the corner of a step and a Prickly pear had taken hold at the side of the path, growing through more Bear’s Breech. 13:50 From here on the walking gets more strenuous on the way to the top. The steps continue and lead to the Goat’s hair Twin Caves. It’s hard to imagine that these caves would once have been at sea level. Along this stretch were Slender Sow thistle and a stem of Branched Broomrape, which is parasitic on the Oxalis it is growing amongst. 13:56 At the top of this flight of steps the path passes through a short World War 2 tunnel. Growing from the rock on the Tunnel’s side was a pretty group of Sea daisies and Sweet Alison. Sweet Alison is a common plant here in Gibraltar and on mainland Southern Spain, but every time I see it it reminds me of British summer bedding displays – garden borders edged with alternate white Alison & blue Lobelia. By the side of this stretch of path was another butterfly, a female Moroccan Orange Tip. 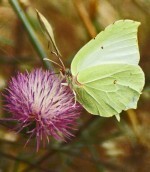 The females are similar in appearance to our northern Orange Tips, but the males 14are bright yellow instead of white. On a plant of the mustard/cabbage family, the butterfly was ovipositing (laying an egg) – these are the food plants of the species larvae. More Giant squill with a stem of Wall barley grass. 14:10 – A bit higher up and a stunning view across to the Costa del Sol. Another superb view looking north along the east face of the Rock down onto Sandy Bay and along to Spain and the coast of the Costa del Sol. Directly above the Bay were the now disused Water Catchments. The slope on which they sat is the Great Gibraltar Sand Dune, an ancient consolidated sand dune. Rainwater flowed down the slope into an open channel which fed into the reservoir system inside The Rock. In 2001, the Gibraltar Ornithological and Natural History Society began to oversee the dismantling of the catchment construction. By 2006 the slope was fully restored to its natural state and is now being recolonised by vegetation native to this unique habitat. Further round to the north of Sandy Bay is Catalan Bay. 14:15 There’s a little building up here, built by the military for use as a gun emplacement or observatory. It certainly has a wonderful view. There were a few scattered patches of one of Gibraltar’s special plants up here; the Gibraltar Candytuft. Not the best examples, but at least I found some. 14:22 Another fairly gentle upward section of path. 14:24 Looking down onto the vegetation and the little building I just left. 14:27 Another straight stretch passing by a large Shrubby Scorpion vetch that smelt lovely. 14:34 A long steep set of steps to climb, but getting closer to the top. I love this view of a gull that was sitting on a rock above looking over its edge. 14:43 And yet more steep steps. A junction of cliff face, rocks and man-made walls. 14:48 The final flight of steps! At the top a Red Admiral butterfly sunbathes on a warmed rock. 14:50 The view from the top is spectacular! The estimated time for this walk is 2 hours. My amble took me 3 hours and 20 minutes, but as you can see I made a lot of stops. The steps weren’t that painful! During the day the lower parts of Gibraltar are hectic and noisy with traffic. Most people drive everywhere, take the bus or hire a taxi, so in this small place with a large population, traffic is heavy and subsequent noise levels high. The drone of the constant streams of cars is punctuated with frequent horn-tootings and the waspish buzz of swarms of scooters dodging around them adds another dimension. Noise levels are further echoed and amplified by the proximity of the Rock itself, by the high old sea walls that bound the old town and by the ranks of the tall modern buildings that line the roads. Despite all this, as this fairly short walk shows, there are calm and peaceful oases to be found, busy roads are fringed with beautiful trees and looking upwards, the Upper Rock is cloaked with a mantle that is evergreen. I started my walk more or less at this small ‘desert-island’ of a roundabout and walked along Bishop Caruna Road to the next roundabout, then turned left onto a stretch of the roadway that travels around the base of the Rock, Queensway Road. After about half a mile or so (approx. 600m), or around 12 minutes of walking, I left the noisy pavement to take the scenic route through the green and peaceful haven of Commonwealth Park. 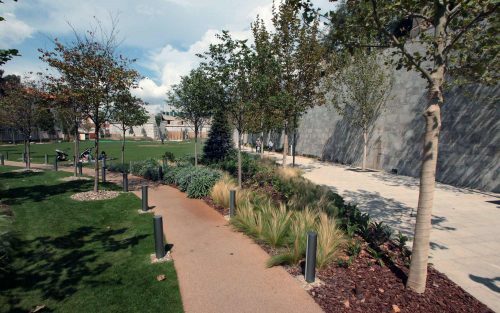 Opened in June 2014, this is the first public park to have been built in Gibraltar since the Alameda Gardens opened in 1816. Flanked by the old city walls the park has been thoughtfully landscape with large open grassy spaces, plenty of trees for shade and a large ornamental pool as well as planted gardens and it has matured into a lovely space that is well used and appreciated. The Park’s visitors are not just restricted to human ones, the water is particularly attractive to birds too. House Sparrows enjoy it all year round and White Wagtails skitter around on the grass chasing flies, but a number of birds not commonly seen in Gibraltar have been spotted here too, including the occasional Egret and this past winter saw the arrival of a Cormorant who stayed around until he had eaten most of the larger fish in the pool! Recent records state that a Woodchat Shrike was seen here on April 1st. I didn’t take many photographs here as there were quite a few people out enjoying the sunshine and I didn’t want to intrude on their peace. I ‘borrowed’ the picture above from the official visitor website. 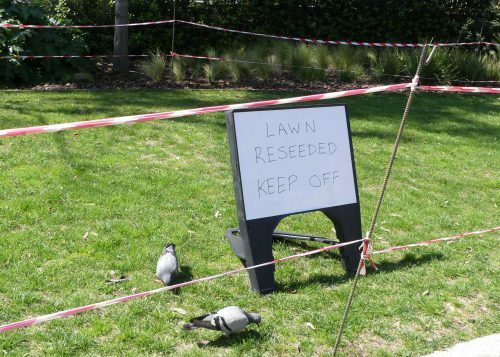 I found the scene below quite amusing though, and couldn’t resist photographing the cheeky pigeons disregarding the sign. 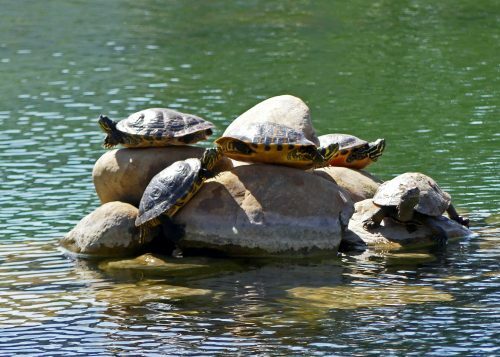 Striped-neck Terrapins had scrambled out of the ornamental pool to sunbathe on a small island of rounded boulders and seemed perfectly happy to pose. 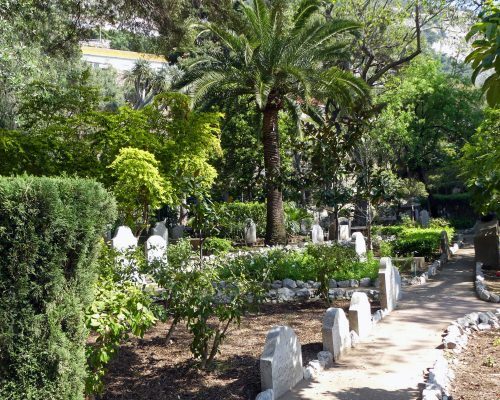 The Trafalgar Cemetery is a peaceful haven for both those laid to rest there and for visitors seeking out its history or a calm place to escape a while from the nearby hustle and bustle. It is immaculately maintained and the old graves are shaded by a variety of beautiful trees and shrubs. 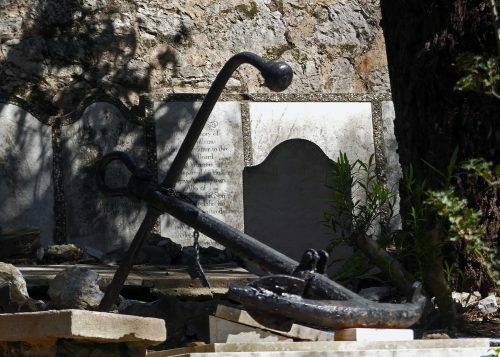 The cemetery was consecrated in June 1798, seven years before the battle of Trafalgar. Known then as the Southport Ditch Cemetery, it may have been a part of the old St. Jago’s Cemetery, which was situated on the other side of Charles V Wall. The association with the battle of Trafalgar does not seem to have been made until many years after the event. The cemetery was used for burials between 1798 and 1814, then fell into disuse. Earlier gravestones from St.Jago’s cemetery were set into the eastern wall in 1932, and a few free-standing stones, some of which date back to the 1780s, have been transferred here over the years from the Alameda Gardens. 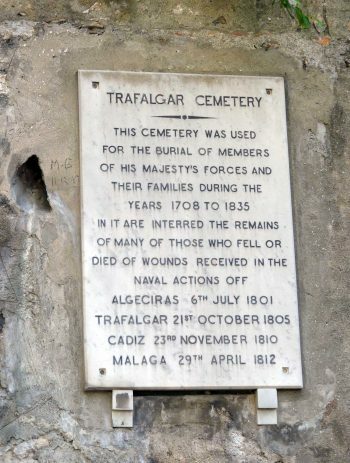 Although the name of the cemetery commemorates the Battle of Trafalgar, only two of those who are buried here actually died of wounds suffered in the battle (Lieut. William Forster of the Royal Marine Corps of H.M.S. Mars and Lieut. Thomas Norman of H.M.S. Columbus). Most of those who died at Trafalgar were buried at sea, and Lord Nelson’s body was transported to London for a state funeral. 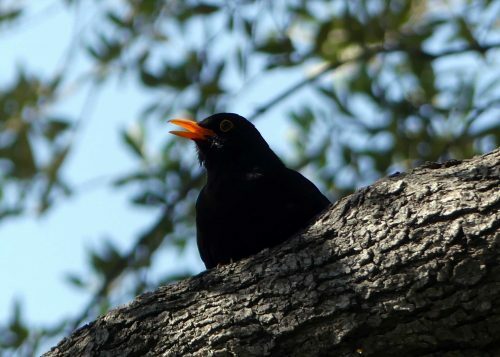 The warm air was fragranced with orange blossom, a male blackbird sang while a female foraged beneath the trees and a chiffchaff was calling his namesake tune from a tall tree. I saw my first butterfly of this trip here, a pretty fresh Speckled Wood. A similar species to our northern European butterfly of the same name, but a rich orange replaces the cream on the wings. Leaving the Cemetery I crossed the road in front of me, walked a short distance then crossed Elliots Way (the road that goes up to the Upper Rock) to the car park, within which is located the Cable Car Base Station. The main entrance to the Alameda Gardens is at its far end. Looking up at the Upper Rock from here I stopped to photograph its new feature, the Windsor Bridge, Gibraltar’s first suspension bridge, which opened to the public in June 2016. 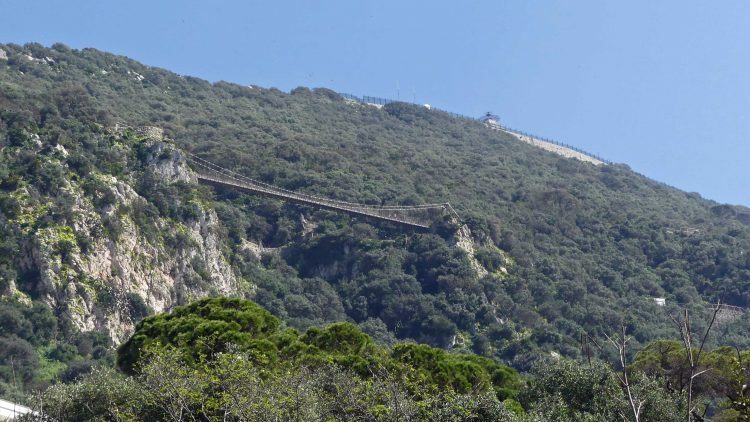 Forming part of the Thrill Seekers Trail of the Upper Rock, the bridge is located between two Batteries, constructed over a 50 metre gorge and is 71 metre long. 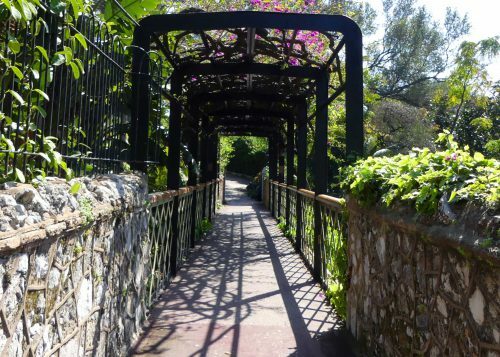 The Botanic Gardens cover an area of around 6 hectares (15 acres); the site was a cemetery before the gardens were commissioned in 1816 by the then British Governor of Gibraltar General George Don. In 1815, considering that “there being no place of public recreation in this Garrison” he “was induced…to establish a walk around the Grand Parade, and form what is called in this country an Alameda, where the inhabitants might enjoy the air protected from the extreme heat of the sun”. Alameda is derived from the Spanish word “Alamo”, or White Poplar Populus alba, and old writings mention these trees growing along the Grand Parade. To avoid the use of public expenditure the gardens were laid out with voluntary contributions, including some from the Amateur Theatre and monies raised by a series of public lotteries. Following the 1970s the gardens had deteriorated and had fallen into a poor state. Since 1991, the restoration of the Alameda as a Botanic Garden has been in the hands of Wildlife (Gibraltar) Ltd., on contract to the Government of Gibraltar. The aim is to develop the gardens in ways that will enhance enjoyment, conservation and education, so that its future will be even richer than its past. In 1994 the gardens saw the addition of a zoo: the Alameda Wildlife Conservation Park. 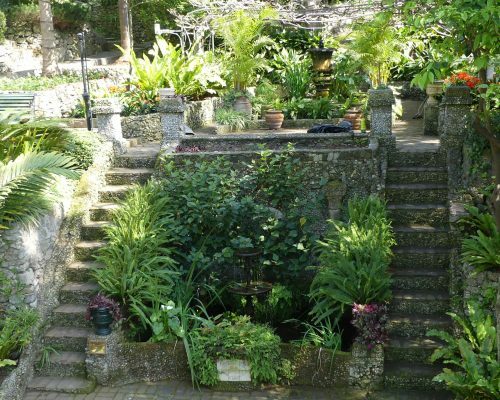 The gardens are laid out with a network of interconnecting paths leading around water features and terraced beds built from the local Jurassic limestone. 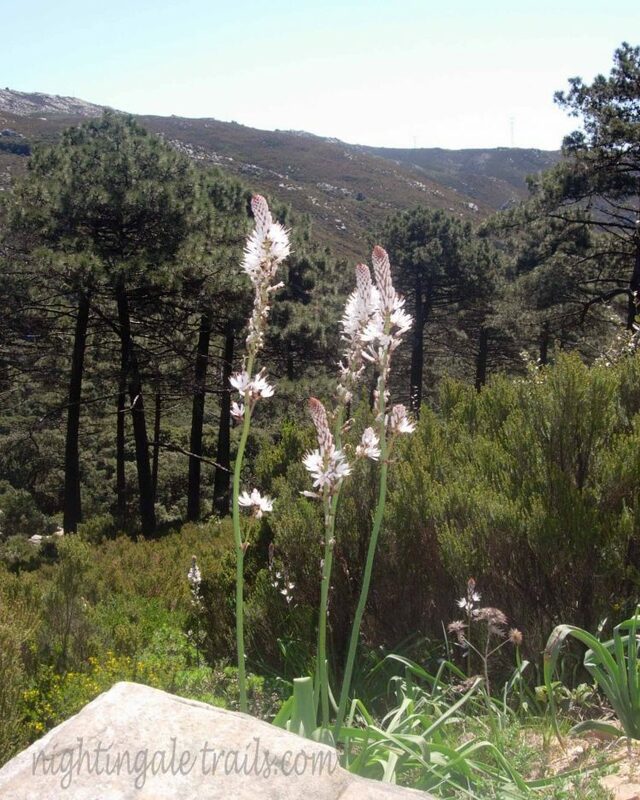 The planting includes Mediterranean species, including some endemic to Gibraltar. There is also an African bed and an extensive cactus garden. 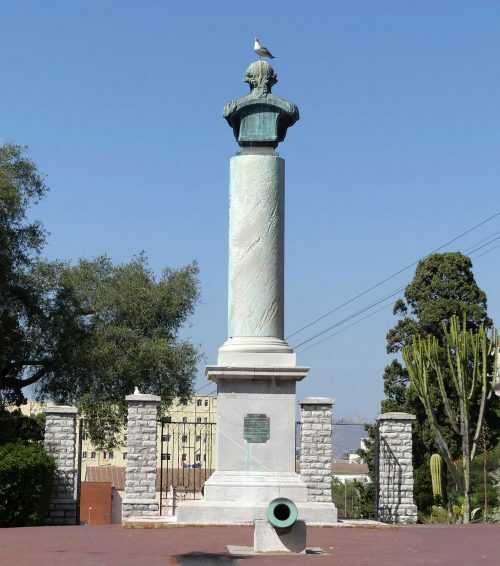 At path junctions and in other strategic places are placed antique guns and other artillery that commemorate Gibraltar’s military heritage. A number of features were gradually added to the gardens, most reflecting historical facts or personalities. Entering through the main gates you are greeted by one of the oldest and the tallest of them; a memorial of George Augustus Eliott, 1st Baron Heathfield, guarded by four 18th-century howitzers (canons). 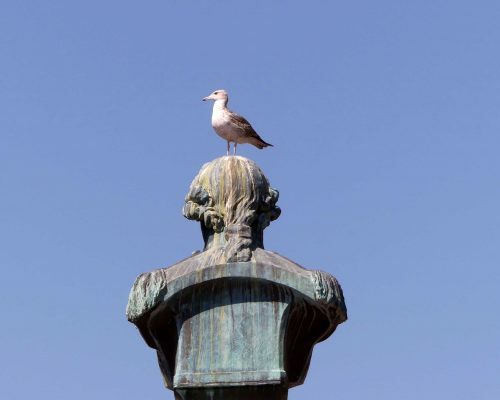 The statue was photographed from behind as I spotted a cheeky juvenile Yellow-legged gull perched on top of the General’s head. A favourite feature of mine is the bridge with its attractive pergola tunnel, presently shaded with flowering Bougainvillea, that spans the Dell and Sunken Garden. I like the patterns the pergola and railings make on the paving of the bridge. It also affords good views down onto the sunken gardens of the Dell. The bridge is named for Guiseppe Codali who was the head gardener and horticulturalist of the Gardens during the mid-19th Century. He was Italian, from Bergamo and was brought to Gibraltar specifically to work in the gardens. His Italian influence can be seen particularly in the bridge and sunken garden, The Dell, in the centre of the Alameda which was opened on the 24th September 1842 and re-inaugurated 150 years later on 24th September 1992. This pair of whale jaw bones was originally placed at one end of the Dell Bridge. Their origin is long forgotten , but whalers regularly called into Gibraltar until the early 20th Century. 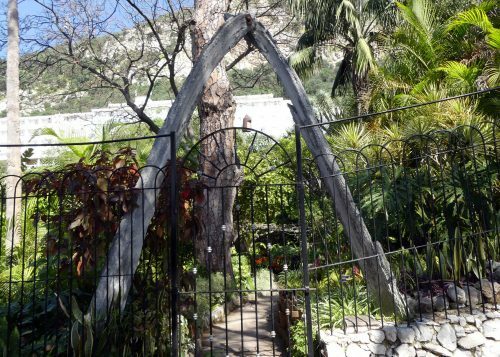 The bones now form an arch over the gate leading into the Dell. 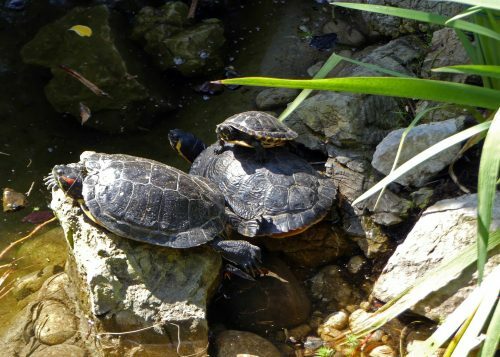 Stripe-necked Terrapins stack up to enjoy the sunshine on the edge of a pool in the Dell. 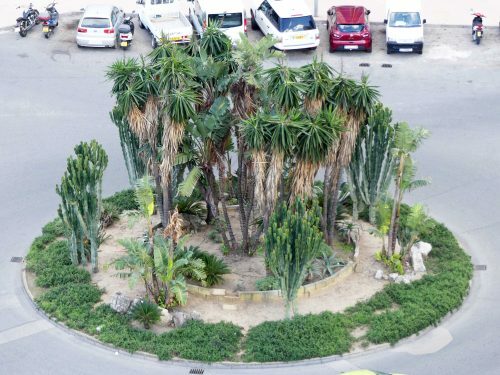 The plants of the Alameda Gardens are a combination of native species and others brought in from abroad, often from former British territories like Australia and South Africa with which Gibraltar had maritime links at the time of the British Empire. 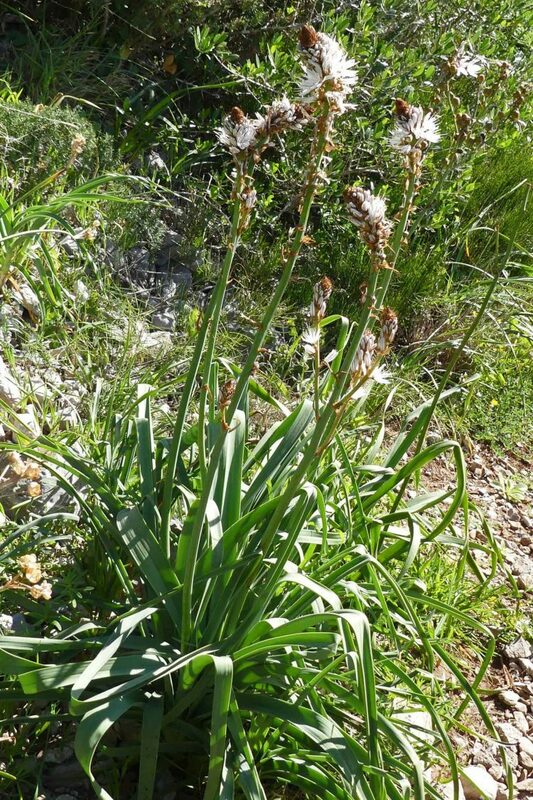 Since 1991 many new species have been planted, some growing in Gibraltar for the first time. There are so many beautiful plants here it takes many visits to appreciate them properly, but here are some of my personal favourites. 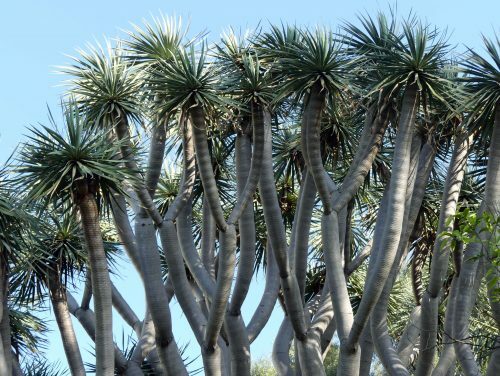 The gardens have a stunning collection of Dragon Trees Dracaena draco, the oldest of which is over 200 years old, perhaps as much as 300, and would have been amongst trees here that pre-date the opening of the gardens. It is still young though, there are claims that they live upwards of 1000 years! An unusual member of the lily family The Dragon Tree comes from the Atlantic Islands of the Canaries, Madeira and Cape Verde. The smooth grey bark is reminiscent of an elephant’s hide and its red resin, which quickly crystalises, was used medicinally and known as Dragon’s Blood. Its panicles of showy white flowers appear irregularly in summer and produce bright orange berry-like fruit in winter. 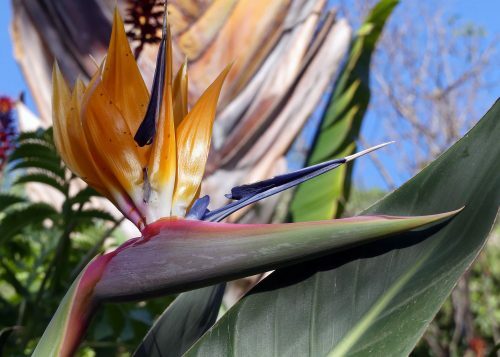 There are Bird of Paradise plants, Strelitzia reginae, in several spots throughout the gardens. The species is originally native to South Africa and is the most exotic of flowers I think and so aptly named – I fancy this group looks just like a flock of large-billed birds about to take flight. Its scientific name commemorates the British queen Charlotte of Mecklenburg-Strelitz. 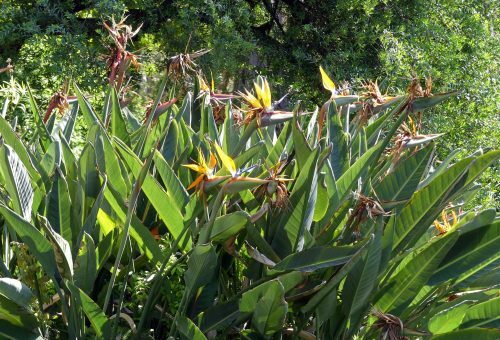 Another species of Strelitzia grows here too, it’s much larger and I think it may be S. nicolai , which is the largest in the genus, reaching as much as 10 m tall and producing stately white and blue flowers.The leaves are large and similar to a banana leaf in appearance. This beautifully newly-pruned tree shows the leaves grow in two ranks to form a fan-like crown of evergreen foliage. There is a flower bud squeezing between the leaf stems. The gardens are rich in wildlife. Bird species nesting here include Sardinian Warbler, Blackcap, Blackbird, Robin, Greenfinch, Serin and Wren. Winter additions include Grey and White Wagtail, Chifchaff, Black Redstart, Chaffinch, Short-toed Treecreeper and occasionally Kingfisher, while notable birds of passage periods are Hoopoe, Redstart, Woodchat Shrike and flycatchers. 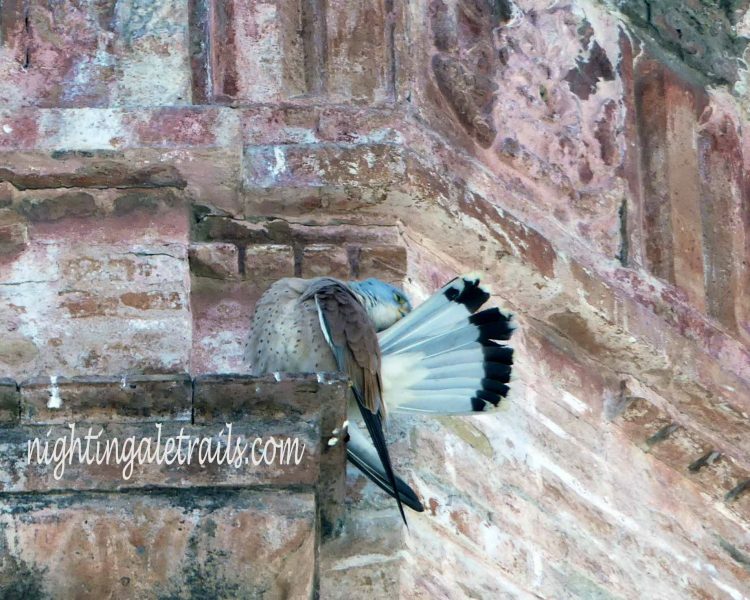 Kestrel (throughout the year) and Booted Eagle (in winter) regularly hunt in the grounds. 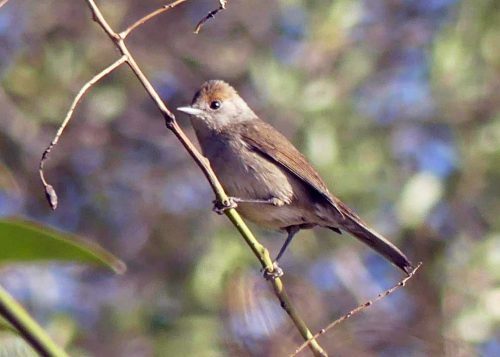 I spotted a female Blackcap nearby, a species that is a year-round resident in the Gardens. 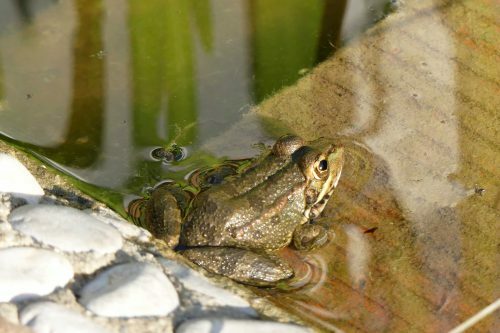 There is a small raised pond in the courtyard between the administration buildings and greenhouses where I caught a resident Perez’s frog – Pelophylax perezi basking in the sunshine. 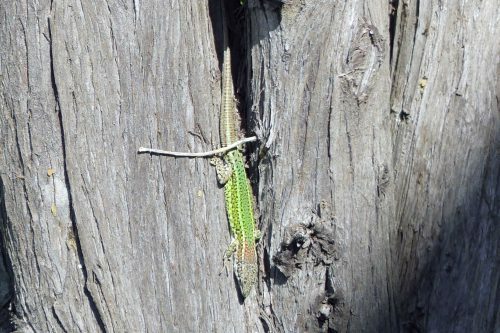 Other wildlife that may be spotted are reptiles including the Moorish Gecko and Iberian Wall Lizard, Amphisbaenian and the harmless Horseshoe Whip Snake. Of the bats, the Pipistrelle is the commonest (often seen during the day), while Schreiber’s Bat and the European Free-tailed Bat can also be seen. One of the gardeners here has an incredible talent for propegating plants and takes great pains to display stock plants in a perfectly ordered way. 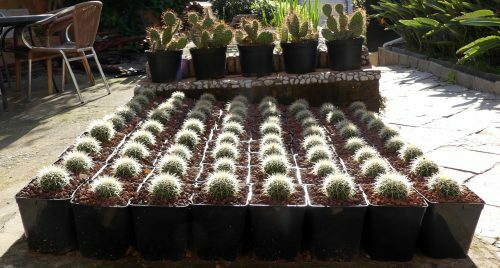 At one end of the pond is an immaculately arranged collection of cacti. 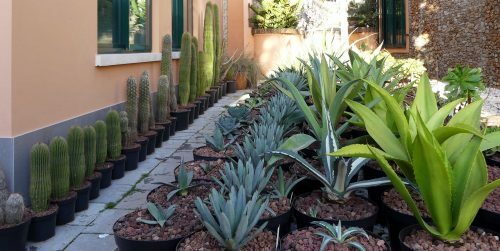 More cacti stand in a rank along a wall opposite a collection of various Aloes. 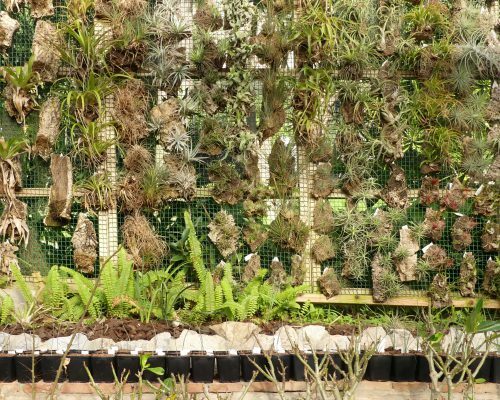 and finally for this visit, is a iew of part of his display of the epiphyte collection: a beautiful piece of living art. 07.30- We reached the Bird Observatory on the Upper Rock a little before it was properly light. Through a shroud of mist, dawn was subtle, washing the buildings of Algeciras, the hills beyond Gibraltar Bay and the Moroccan coast with diffused shades of amber. 07:45 -We were here for birds as my friend and wonderful host Jill, is in training as a bird-ringer and was hoping for some practice in this highly skilled art, but thus far this morning had been disappointing for the current resident ringers. Not only was it cool and misty, but also and worse was that the cold wind was blowing in the wrong direction to bring migrating birds over the Strait in this direction, so the mist nets were very sparsely populated. If there are no birds to process and record, a day with a dawn start can seem very long up here, despite the amazing views. 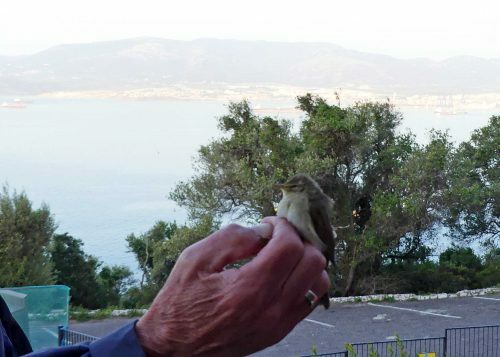 Gibraltar has long been recognised as a key location for observing the migration of birds and the Bird Observatory, run by the Gibraltar Ornithological and Natural History Society (GONHS), is a highly desirable venue for bird-watchers and in the appropriate seasons, bird-ringers, from many parts of the world. 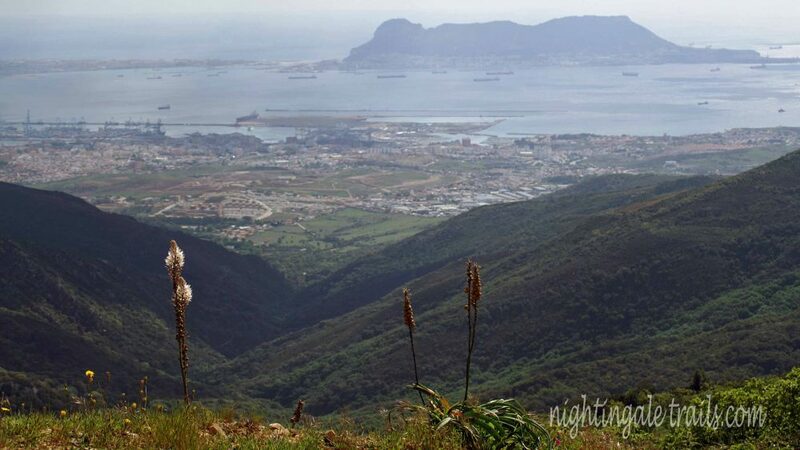 Perched high on the Upper Rock the views from the front door extending across the Bay of Gibraltar, over Algeciras and across the Strait to the Moroccan coast are truly stunning. 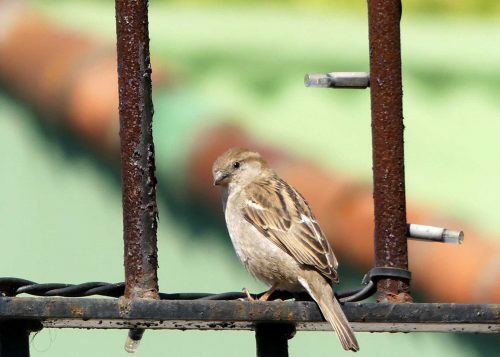 The climate is appealing too, but of course it’s the opportunity to witness birds on their migration passages, often in great numbers, that draws them here. 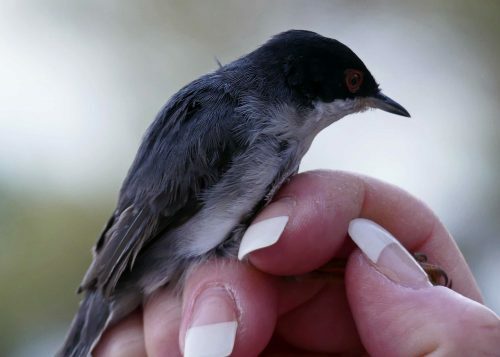 Inside the Field Centre, suspended on hooks above the ringing bench, a male Sardinian Warbler and a Willow Warbler were waiting in little cotton bags to be ‘processed’. 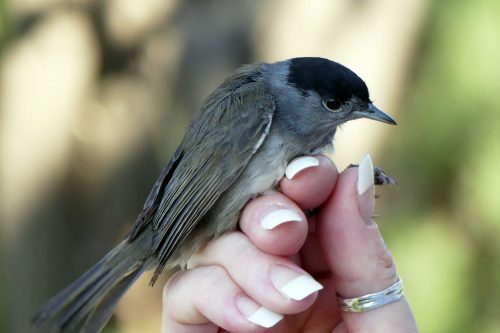 Within minutes the birds were quickly and carefully weighed, measured, ringed, entered into the record book and released. 08.00 – By way of a diversion, the moth light trap is opened up to reveal last night’s bounty. There were a good number in there of an interesting variety of species ranging from tiny micro-moths to a spectacular Tiger Moth. I left it to the experts to ooh and aah at the really tiny ‘micros’ and concentrated on the bigger, showier ones that I had a hope of recognising if I ever see them again! I knew the lovely Tiger Moth with its rich red underparts and was quite taken with the Shark Moth, so-called because of its shape in profile. 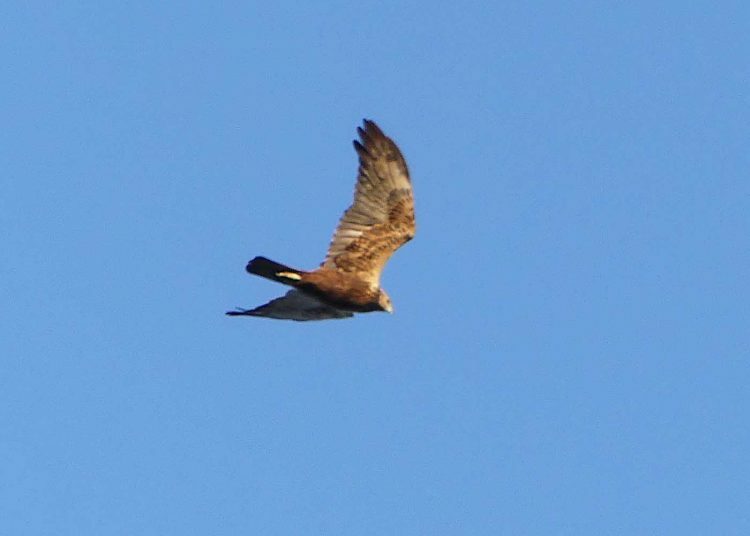 08.17 – Excitement as an incoming Marsh Harrier dashes overhead-the sighting was brief, but we thought a male as has black wingtips. 0919-In the sheltered ‘garden’ area at the side of the Obs there is a small pool of water inhabited by frogs. As the sun gathered strength the warmth brought them out to sunbathe and the males began to sing. Their human neighbours were not as happy to hear them as I was; apparently they’d be singing loudly for most of the night. 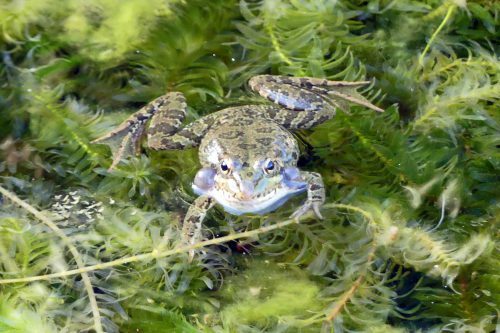 I don’t know his species, but according to the GONHS website, frogs present here in Gibraltar are introduced and of the species Rana (Pelophylax) perezi (Perez’s Marsh Frog). Maybe someone will confirm or correct me? Other insects were also appreciating the sunshine; an interestingly coloured millipede warmed himself on a wall and little bees were gathering pollen and nectar, particularly from Rosemary and Tree germander. 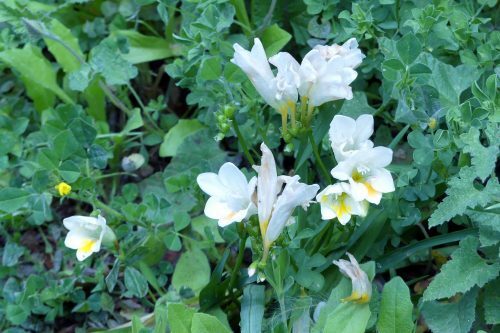 There are wildflowers here too, including some elegant and highly fragrant Freesia blooms. Not a native plant, but one-time introduction originating in South Africa, it is now naturalised in a variety of locations around the Rock. It’s much tougher than it looks, here it competes for headroom with other native plants, but it is also found pushing up through cracks in paving and against walls. Another plant flowering is the Pitch Trefoil or Bitumen Pea, so called because if crushed the plant releases an aroma uncannily like that of the tar they use to repair road surfaces, which happens to be one of my life-long favourite smells, so I love this plant! 09.44 – Busy with the wildflowers I missed a sighting of a Dark-phase Booted Eagle, so no photo, but I did catch the single Black Kite as it passed overhead. The wind changed slightly, but was still not from the most desirable westerly direction. 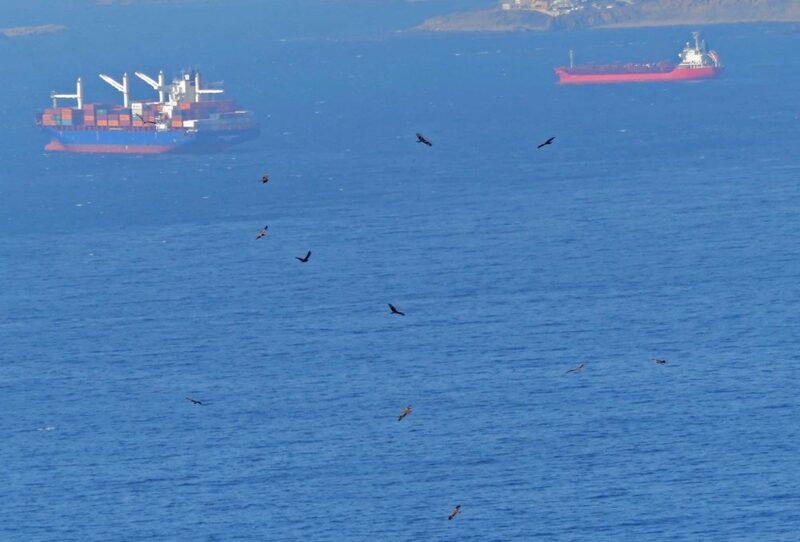 Mist still hangs over the Strait and the Bay, but the appearance of the Black Kite prompted scanning with binoculars as these most numerous of incoming raptors frequently travel together in variously sized flocks. There were more! In conditions such as today’s when visibility is limited, birds often fly close to the surface of the water and have to flap their wings to maintain momentum, expending precious energy. Arriving close to land again and once they can see where they are and want to be, they begin to circle seeking currents of rising warmer air. These ‘thermals’ will enable them to gain height without flapping and once they are up high they are able to glide towards their destination on the wind. Jill retrieved a very feisty female Blackbird from the mist net. Already ringed, she was clearly a local resident bird and a brood patch on her breast showed she was nesting, so was quickly set free. My last pictures of the morning here was of a large Wall Lizard, that looked like it was in the process of shedding its skin. and another wildflower, this one growing at the front of the building, White Mignonette, is also planted in gardens as an ornamental. A cold but very varied and enjoyable morning, enhanced by several hot cups of tea and a hot-cross bun. 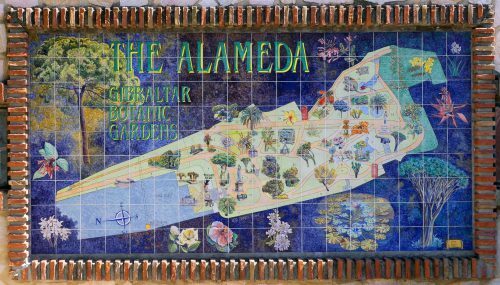 Looking forward to a bit of a rest, lunch and a walk up to the Alameda Botanical Gardens this afternoon……. I am recently returned from spending a brilliant few days in Gibraltar and Spain and am looking forward to sharing some ‘real time’ posts in the coming weeks. Landed in Gibraltar at 17.43, a little later than scheduled, but down to a ‘missing’ passenger at Gatwick, taking his luggage off caused missing our take-off slot. It was a mostly smooth and scenic flight. Snow on Pyrenees in the north-east of Spain, then much of the country veiled by misty cloud, so visibilty for aerial shots not good, but could see the unfolding panorama below well enough. Weather here was still sunny and a balmy 19°C, had been warmer earlier on. I was told I was lucky with the weather. Last week stormy weather and high winds meant most flights in and out were diverted to Malaga. Landing in Gibraltar International Airport is always dramatic. Although consistently listed as one of the world’s scariest for air passengers, I can honestly say I have never found it so. 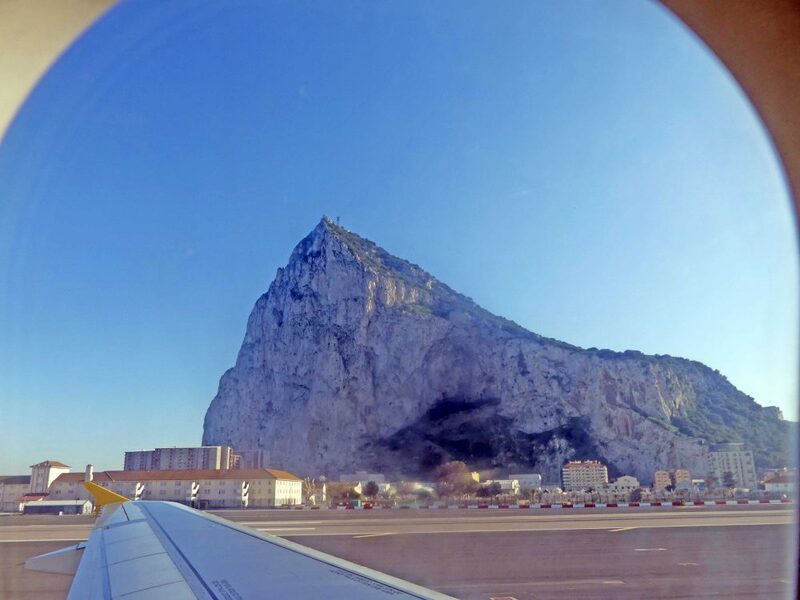 Problems arise as the airfield is exposed to strong cross winds around the Rock and across the Bay of Gibraltar/Algeciras, sometimes making landings, particularly in winter, a little uncomfortable and occasionally impossible, but in that event planes are diverted to Malaga to land. 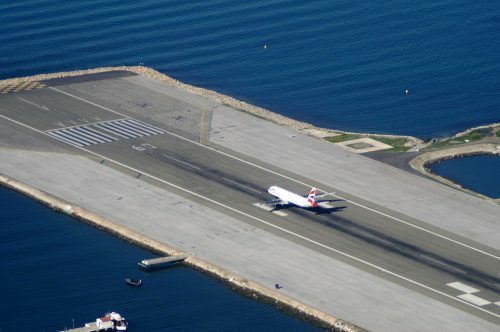 The runway is also shorter than many, has the sea at either end and is crossed by the main road into and out of Gibraltar, but under the control of the RAF this is probably one of the most secure and highly scrutinised airstrips in the world too. Gibraltar is well-known to many as a British Overseas Territory with an ongoing political history of dispute with Spain as to its sovereignty. However, despite features that are recognisibly British, like English signage and language spoken, pubs, red phone and pillar boxes, the Morrison’s supermarket and the Police uniform, this is not a piece of England! 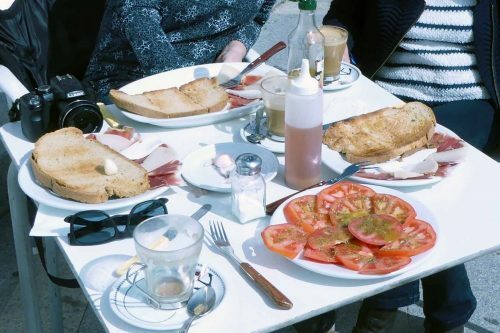 Spanish is also widely spoken, they drive on the right and the local cuisine is similar to that of Spain, but it is definitely not Spain either. This is Gibraltar and the majority of the population are Gibraltarian born and bred and rightly proud to be so. I’ve realised recently that although most people are aware of Gibraltar, easily recognising images of this iconic ‘Rock’, not so many know exactly where in the world it is. 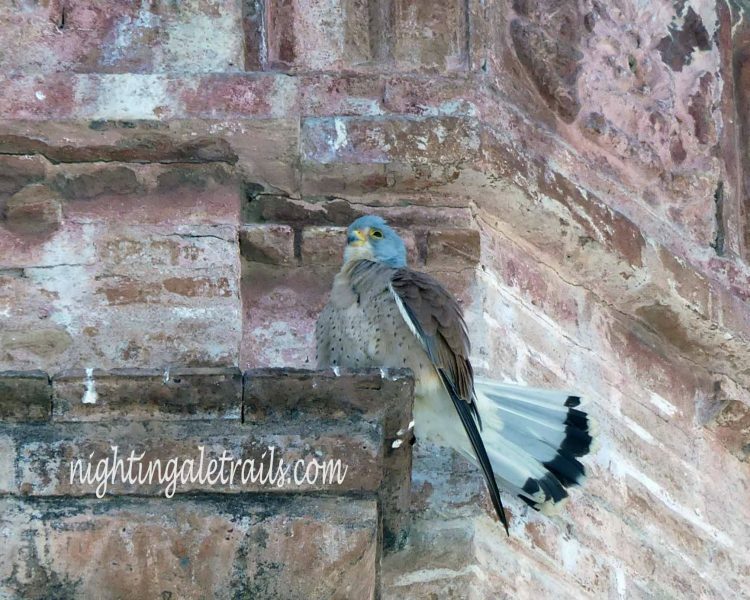 My own interest and past involvement with Gibraltar has been, and still is, largely connected with its natural history: the Rock supports a surprisingly rich and diverse fauna and flora, which my next few posts will mostly reflect. 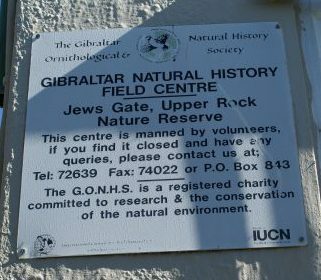 It is Gibraltar’s geology and its geological location that makes it such a unique and fascinating place for those interested in natural history: but those factors have also determined and shaped its history, culture, politics and society. There’s a great deal I didn’t really know myself, so as I was here for a few days I thought I should find out more. Gibraltar has been in the news rather frequenty lately too, in connection with Britain’s ‘Brexit’ from Europe, so I thought it might be interesting to look at how Gibraltar came to have British sovereignty in the first place. I’ve tried to keep it brief, but although a relatively tiny place, there’s an incredible amount packed into it, so forgive me if it goes on a bit. Gibraltar’s terrain consists of the 426-metre-high (1,398 ft) Jurassic limestone Rock of Gibraltar and the narrow coastal lowland surrounding it. Its territory covers 6.7 square kilometres (2.6 sq miles) and shares a 1.2-kilometre (0.75 mile) land border with Spain. 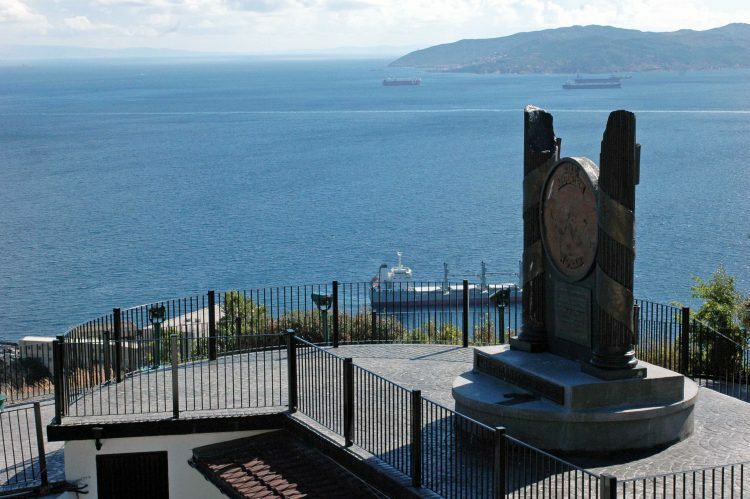 It is located on the southern end of the Iberian Peninsula, on the northern side of the Strait of Gibraltar, in Spanish Estrecho de Gibraltar, that run from the Atlantic Ocean to the Mediterranean Sea. 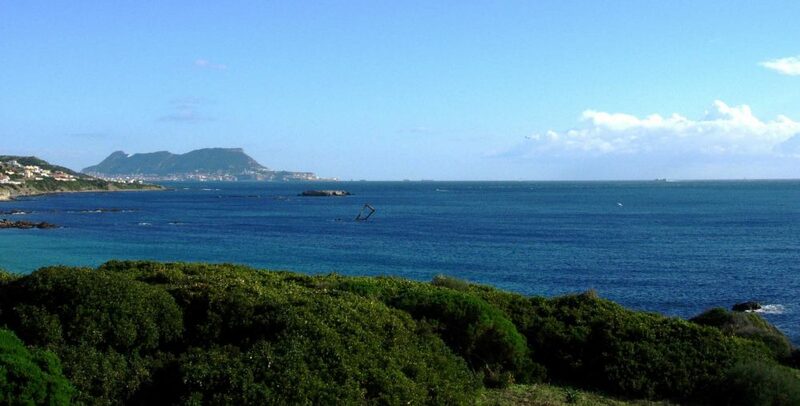 This narrow body of water connects the Atlantic Ocean to the Mediterranean Sea and separates Gibraltar and Peninsular Spain in Europe from Morocco and Ceuta (Spain) in Africa. Europe and Africa are separated by 7.7 nautical miles (14.3 km; 8.9 miles) of ocean at the strait’s narrowest point. Gibraltar from the air shows its position in relation to Spain. Photographed after take-off, the following photograph shows the West Side of the Rock and the southern tip that points towards North Africa. The shoreline of Gibraltar measures 12 kilometres (7.5 miles) in length. There are two coasts or ‘sides’ of Gibraltar: the East Side, which contains the settlements of Sandy Bay and Catalan Bay; and the West Side, where the vast majority of the population lives. 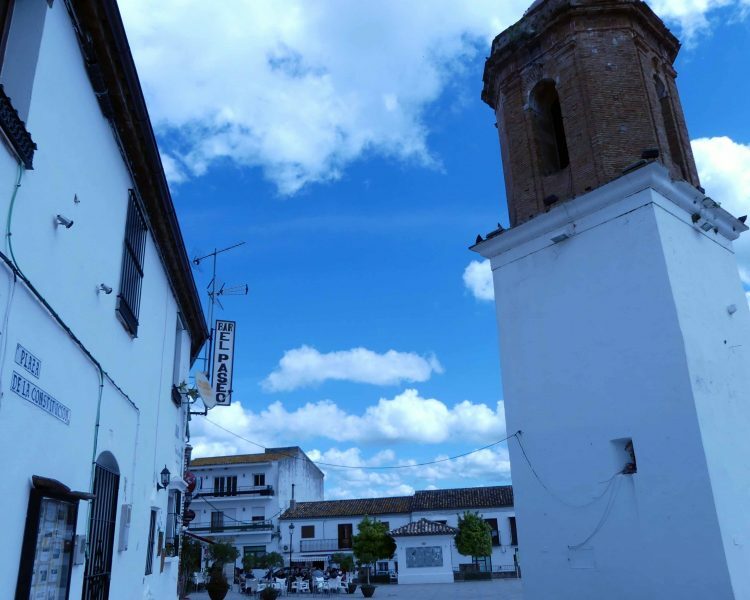 The town of La Línea de la Concepción, a municipality of the province of Cádiz, lies on the Spanish side of the border. 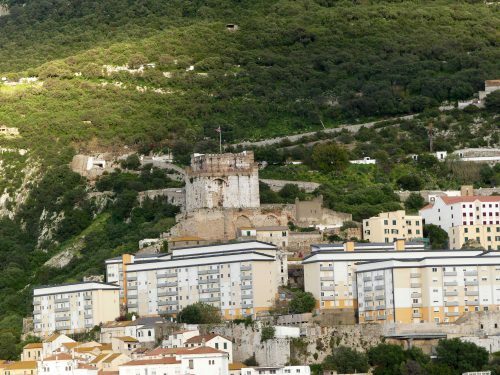 The Spanish hinterland forms the comarca of Campo de Gibraltar, which translates literally as “Countryside of Gibraltar”. On the opposite, southern side of the Strait lie Morocco and Ceuta, which is a Spanish exclave (a part of a state or territory geographically separated from the main part by surrounding alien territory). 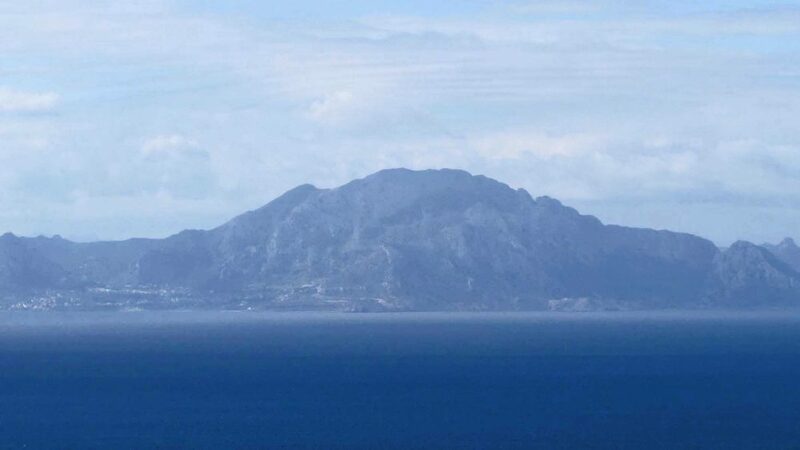 Variably visible from Gibraltar, depending on the degree of mist, is the part of the African coastline defined by the Atlas Mountains. The Straits are just 14 kilometres wide at this point and a hazardous place to be due to the immensely strong currents. The Strait lies mostly within the territorial waters of Spain and Morocco, except for at the far eastern end. 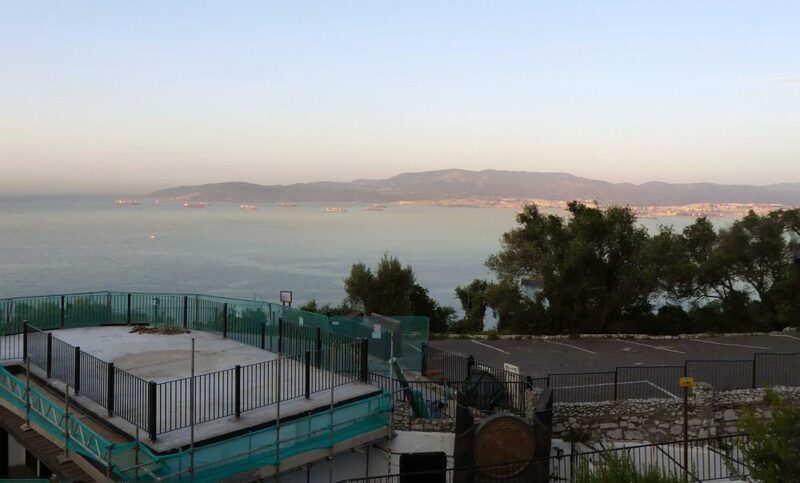 The United Kingdom (through Gibraltar) claims 3 nautical miles around Gibraltar putting part of the Strait inside British territorial waters, which then means that part of the Strait therefore lies in international waters according to the British claim. However, as we are aware, the ownership of Gibraltar and its territorial waters is disputed by Spain, and similarly Morocco dispute the far eastern end (of Ceuta), which is owned by Spain. It’s complicated. The highest point of this photograph is Jebel Musa, which is 851 metres high and located five kilometres west of Ceuta in Morocco to the south. 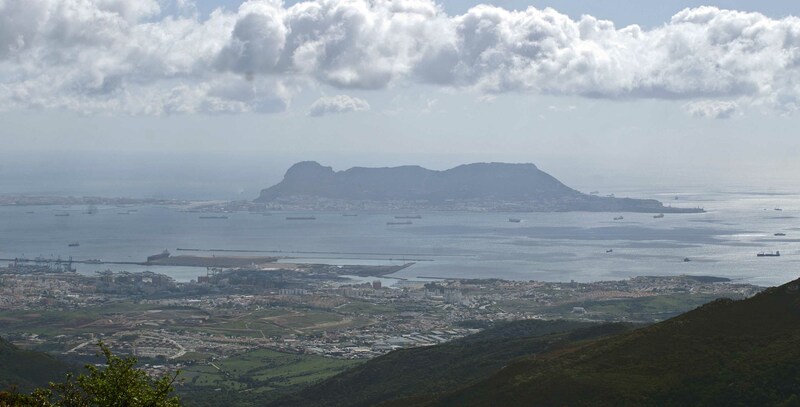 Together with the much smaller Rock of Gibraltar at just 426 metres, these two mountains guard the entrance exit to the Atlantic Ocean from the Mediterranean Sea and form the Pillars of Hercules. The distinctive Rock is visible from miles away. Often shrouded in mist, its unmistakable bulk can still be readily identified from many locations along the Spanish coast and particularly from the vantage point of mountains that have views to the south, all of which help to place it in the wider landscape. 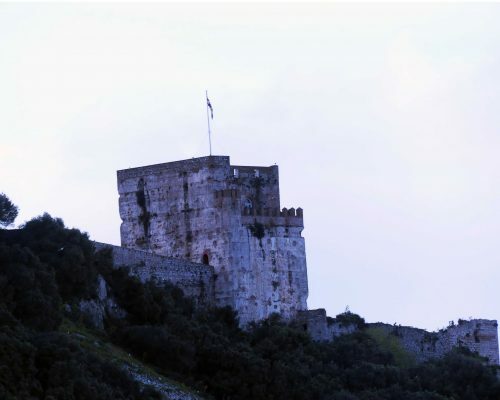 View of the northern face of the Moorish Castle’s Tower of Homage. Built in the 14th century. It is a unique and fascinating place historically and culturally. In ancient history its strategic geographical position on the northern boundary of the Strait of Gibraltar saw it occupied and influenced in turn by Neanderthals, Phoenicians, Carthaginians, Romans, Vandals, Visigoths and most pronouncedly by the Moors. The name Rock of Gibraltar originates from the Arabic Jebel Tariq, meaning “Tariq’s mountain” was named after Tariq ibn Ziyad. In 1462 Gibraltar was finally captured by the Spanish Juan Alonso de Guzmán, 1st Duke of Medina Sidonia. There was some to-ing and fro-ing of control amongst the Spanish themselves, but it remained Spanish until 1704, when during the War of the Spanish Succession, a combined Anglo-Dutch fleet, representing the Grand Alliance, captured the town of Gibraltar on behalf of the Archduke Charles of Austria in his bid to become King of Spain. In 1713 the Treaty of Utrecht ceded control of Gibraltar to Britain ” in perpetuity”, to secure Britain’s withdrawal from the war. Unsuccessful attempts by Spanish monarchs to regain Gibraltar were made with the siege of 1727 and again with the Great Siege of Gibraltar (1779 to 1783), during the American War of Independence. Britain’s interest in Gibraltar historically has been a military one. It became a key base for the British Royal Navy, playing an important role prior to the Battle of Trafalgar (21 October 1805) and during the Crimean War of 1854–56, due to its strategic location. Its strategic value increased when the Suez Canal opened, as it lay on the sea route between the UK and the British Empire east of Suez. In the later 19th century, there were major investments in improving the fortifications and the port. During World War II it was an important base for the Royal Navy as it controlled the entrance and exit to the Mediterranean Sea, which is only eight miles (13 km) wide here. It remains strategically important to this day with half the world’s seaborne trade passing through the Strait. Today Gibraltar’s economy is based largely on tourism, online gambling, financial services, and shipping. The sovereignty of Gibraltar is a major point of contention in Anglo-Spanish relations as Spain asserts a claim to the territory. Gibraltarians overwhelmingly rejected proposals for Spanish sovereignty in a 1967 referendum and again in 2002. 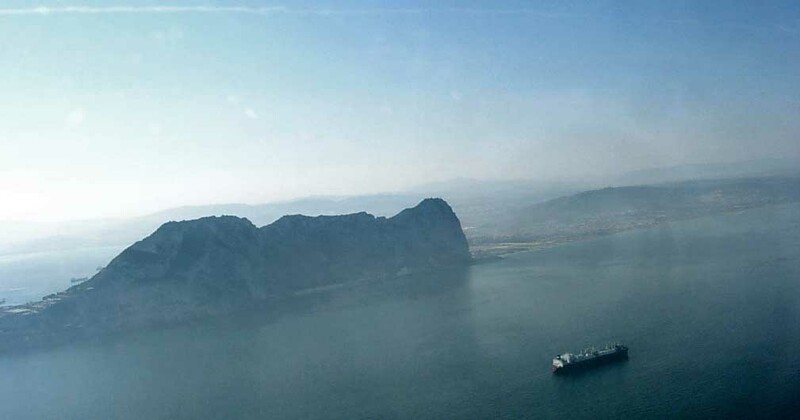 Under the Gibraltar Constitution of 2006, Gibraltar governs its own affairs, though some powers, such as defence and foreign relations, remain the responsibility of the British government. We can only wonder what the future has in store for this iconic Rock, but whatever may happen politically and historically as a result of our human wrangles and power struggles, let us hope that its wonderful wildlife continues to survive and thrive. 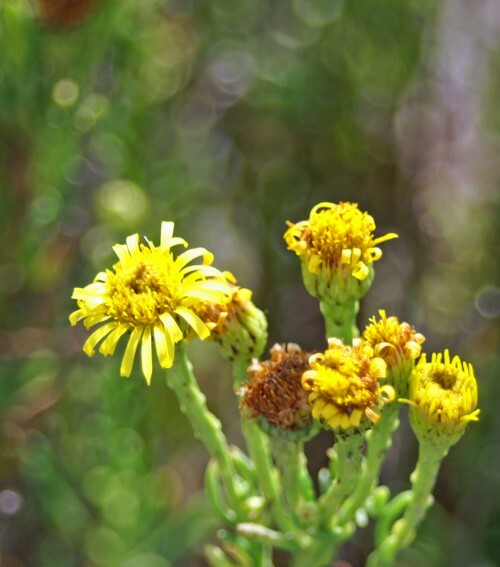 In September, a slight increase in humidity brings forth the appearance of the yellow-flowered Aromatic, or Sticky Inula, which is similar in appearance to Ragwort. It’s not the most beautiful of plants, but it brings some welcome colour back to the otherwise bleached brown landscape ahead of the eagerly anticipated autumn rains and provides a good source of nectar for butterflies. 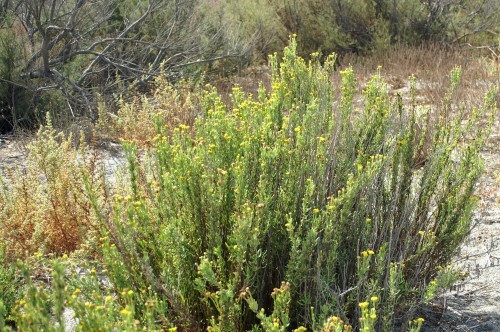 Numerous yellow flower heads and sticky leaves are characteristics of this plant. Flowers in the late summer-autumn months in a variety of habitats, on woodland edges, along roadsides, in uncultivated fields and as in my photographs, even at the back of beaches. As its name suggests it has a pleasant aroma, a bit like camphor, and the plant was traditionally used as a dye of a greenish yellow shade. Recently I bought a bar of Carob ‘chocolate’ in my local health food shop, which reminded me that this is the time of year when the fruits of the Carob trees are ripe for harvesting. 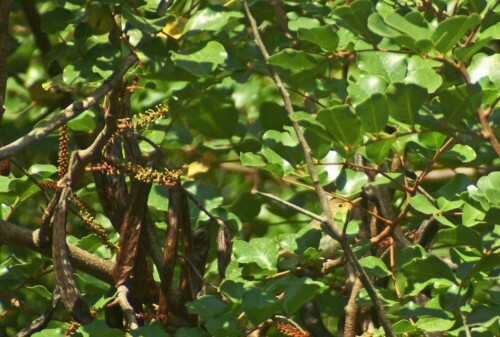 The trees have long been cultivated in Spain where its long brown pods were traditionally used as animal fodder, although nowadays they probably have more value as a natural additive to many human foodstuffs. Carob or St John’s Bread in English; Algerrobo or Algorroba in Spanish and scientifically Ceratonia siliqua, is a species of slow-growing flowering evergreen shrub or tree belonging to the pea family, Fabaceae. It is native to the Mediterranean region where it has been cultivated for some 4,000 years for its edible beans and as an ornamental shade tree in parks and gardens. The tree grows up to 15 metres (50ft) tall and is supported by a thick trunk covered with rough bark. They are slow growing and can live to be 200 years old. 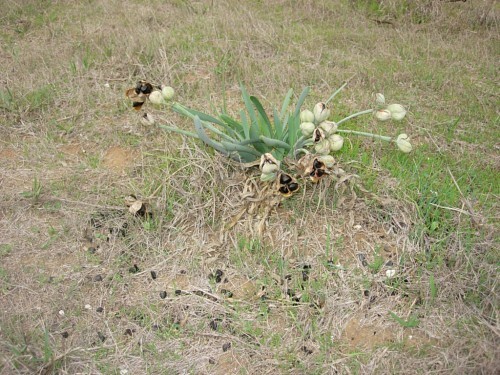 They are well-suited to growing in dry, harsh climates on infertile soils and may produce fruits for 80-100 years. 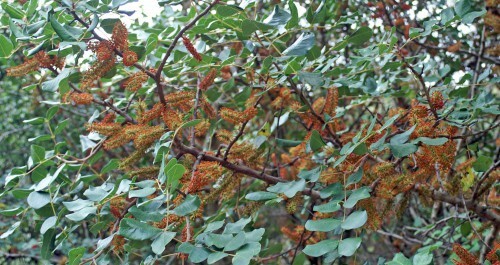 The Carob tree is dioecious (has separate male and female trees), so only the female trees bear fruit. Flowers of the male are stamen clusters with pollen, producing a very strong odor, while the female produces small, yellow, aromatic flowers (pistals), grouped in clusters. Both male and female flowers produce nectar and attract large numbers of insects. There is also research supporting the idea that Carob flowers could be Bat-pollinated as the perfume is released at night and during the cool season when warm-blooded pollinators have an advantage over insects. The perfume of the male flowers is a strong and curious one that may radiate hundreds of meters from the originating tree, particularly in the cooler evening air. Few descriptions of the scent that I have come across are at all enticing. 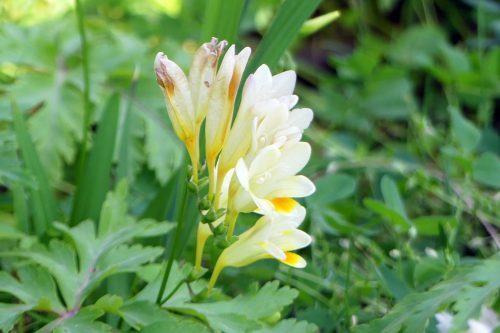 It is even included on one list of the 9 worst-smelling flowers! Others claim it has “the scent of rotting flesh”; then another compares it to sweaty socks. Maybe it is best to stay upwind of a male Carob in flower. 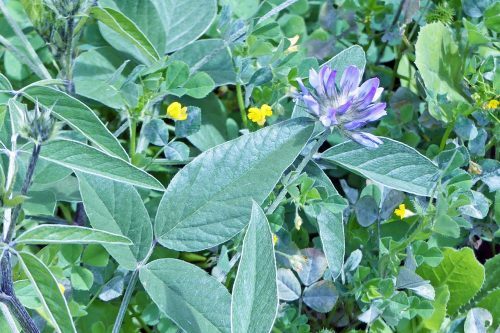 The distinctive pods, or more accurately legumes, take more or less a full year to develop, starting off green and then becoming hard and brown, usually becoming ripe in September or October each year. 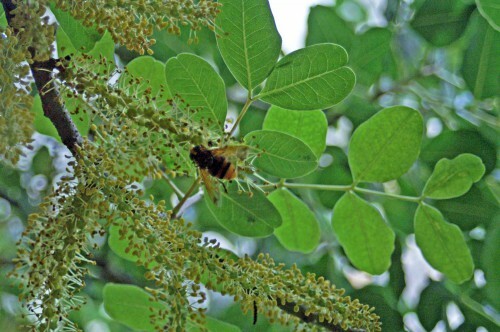 The flowers and ripe pods are then together on the tree simultaneously. Harvesting the pods without damaging the new flowers and next year’s crop must be tricky. In Spain and Portugal this is traditionally done using long canes to dislodge the pods, knocking them into laid-out nets on the ground if it is clear enough, otherwise gathering up is entirely by hand. An extremely labour-intensive operation, particularly as a fully-laden tree may yield a ton weight of pods. 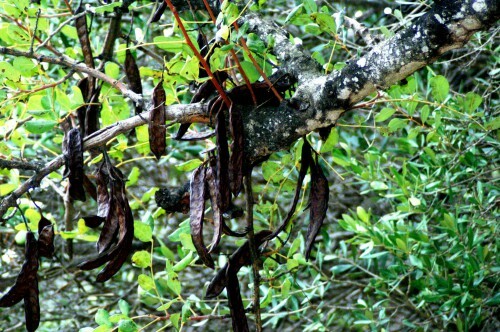 Traditionally Carob pods were used mainly as animal fodder, in Iberia this would have been mainly for donkies. 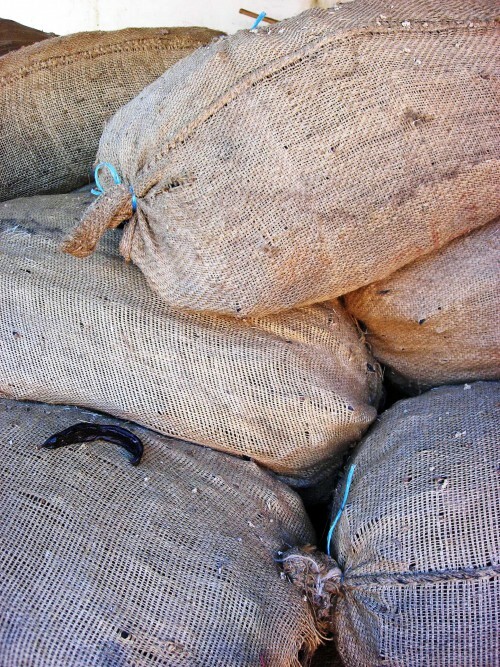 Today, Carob pod meal is still used as an energy-rich feed for livestock, particularly for ruminants. The carat weight measure used for gemstones originated from the weight of the carob seed, which was thought to be consistent. Sadly, modern research has now proved it to be no more consistent than any other seed. The word carat stems from the Arabic word qīrāṭ which was a very small unit of weight based upon the weight of the carob seed in that 5 carob seeds equals one gram and thus a 1 carat weight is 200 milligrams. Spain is the world’s highest producer of Carob, which is now in high demand by the food industry and ad Carob pods are usually processed in their country of origin, this makes it an important contributor to the country’s economy. After harvesting, the pods are both dry and wet cleaned and kibbled (coarsely ground) to separate the seeds from the pulp. After seed extraction, the pods are roasted, milled and sieved and then stored in controlled conditions to prevent them becoming hard and lumpy. The resulting powder, known as locust bean gum (ceratonia or carob bean gum) is then used as a gelling agent, stabilizer or emulsifier in ice-cream, dessert fruit filling and salads. Carob powder is used in baking and food manufacture, sometimes as an alternative to cocoa powder. Carob bars, an alternative to chocolate bars, are often available in health-food stores. Non-dairy carob bars use vegetable fat, soya flour and soya lecithin as an emulsifier. It is naturally sweet so no added sugar varieties are available. 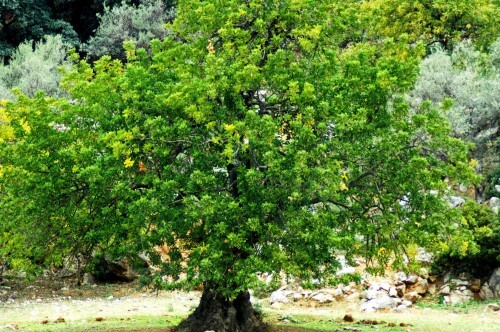 An oil called algaroba is extracted from the carob seeds to be used for medicinal purposes. The height of the holiday season. 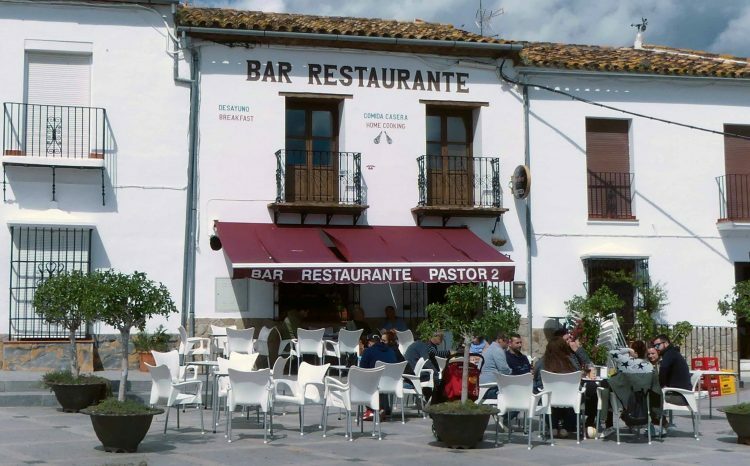 Populations of the mountain and coastal towns and villages increase manyfold now, both with the influx of foreign tourists and of Spanish families opening up their holiday homes, seeking escape from the intense heat of inland towns and cities. August days are hot, often very hot with thermometers soaring to 40° or more inland. On the coast the temperatures may be lower, but there is often a misty haze over the sea and the days can be heavy and humid. 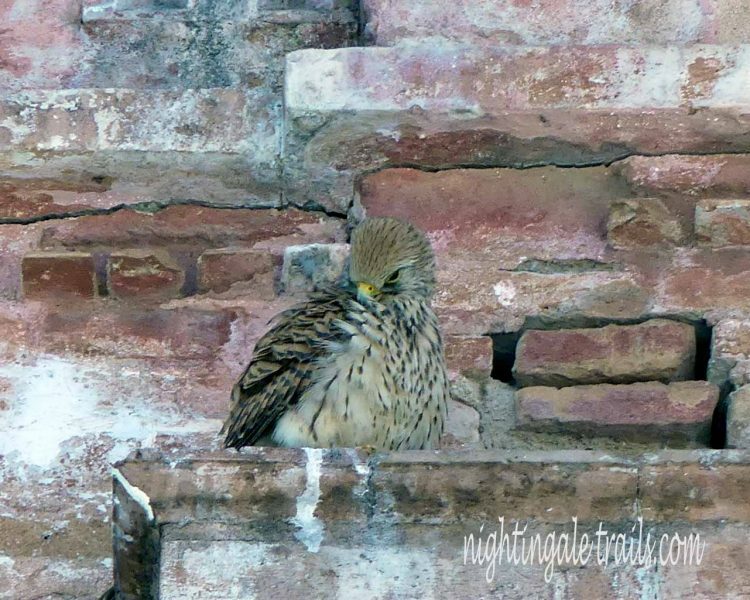 Nights are drawing in and late nights and early mornings can feel quite chilly if there’s a sea breeze blowing. The landscape is dry and dusty, grass is scorched and bleached of all colour. Most of the smaller rivers run dry, their rocky beds exposed. But in many places trees and shrubbery hold their colour, being largely evergreen and evolved to withstand the heat and drought. Forest and grassland fires are a serious risk and in some years raging fires inflict serious amounts of damage to the cork oak woodlands and in some cases houses are consumed and homes are lost. 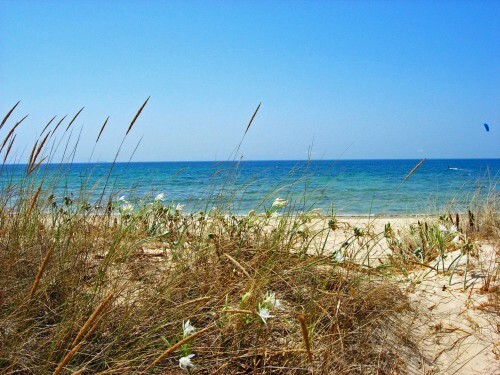 Wildflowers are few, but if you are heading to beaches, particularly those backed by coastal dunes or vegetation, you may be surprised to discover daffodils in bloom! Not your common-or-garden yellow ones, but lovely scented exotic-looking white ones. 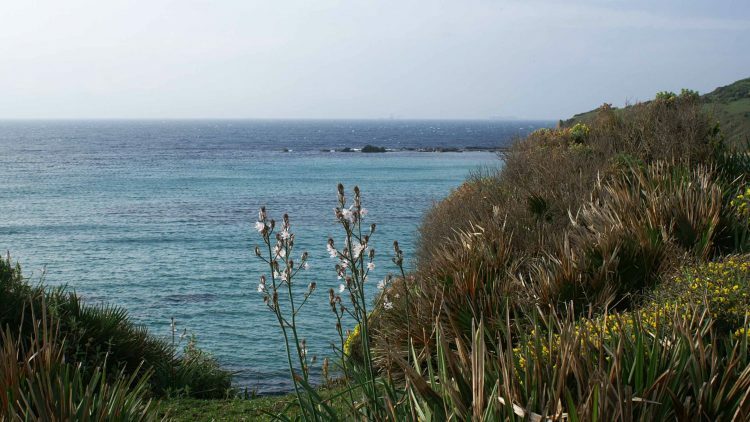 These are the blooms of the Sea Daffodil or Sea Lily Prancaium maritimum. Not really a daffodil at all , but rather a member of the family Amaryllidaceae, these glorious flowers bloom from August until October and are a distinctive species of the Medterranean coastline. 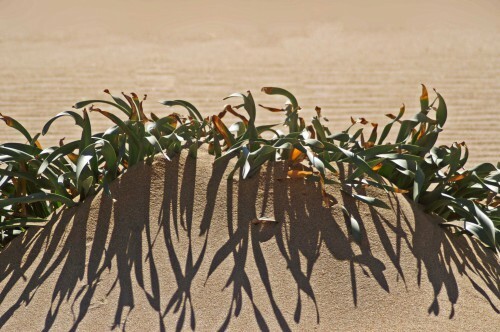 It is amazing that such a lovely plant not only survives, but thrives growing in salt-laden sand, regularly blasted by sandy, salty winds. The flowers open fully in the late afternoon and remain open through the night and into the following morning as they are pollinated by a night-flying hawkmoth. You may well have noticed the green, strap-like leaves of the plant in previous months – they stay green until late in the summer, just until the flowers are ready to open, when they turn brown and wither. 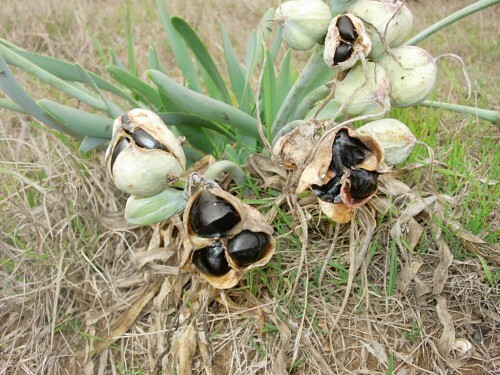 The fruits are large and at first shiny black, like small pieces of polished jet, but they have no weight to them and are readily picked up by the wind and carried away to spread the species. 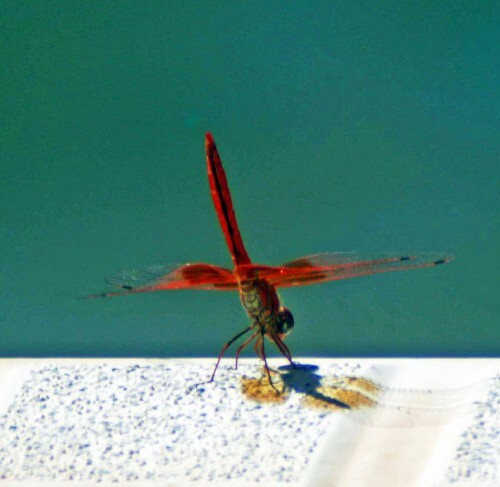 In 2011 I posted about some beautiful dragonflies that laid claim to the water in our out-of-commission swimming pool. I attempted to identify them but it turned out that my visitors were actually exotic recent newcomers from Africa and not the common-or-garden relative species I labelled them as. I would have remained in ignorance had it not been for guidance from some knowledgeable and generous people who took the time and trouble to (most tactfully), correct me, for which I thank them. I decided to ‘reblog’ the post but this time giving the correct identifications and to remove the misleading old one. I’ve timed the posting so anyone planning to visit the area imminently, either seeking, or happening upon any of the species is armed with better information. Late August and early September see the emergence of a variety of species of dragonfly and in 2010 we had regular visits to our garden from some glorious and somewhat exotic ones. Their presence was compensation for our swimming pool being unusable for its proper purpose. The pump wasn’t working, so despite the intense sun it had remained partially filled with water as we were unable to drain it out and the garden sprinklers regularly topped it up each evening. The dragonflies adopted it as their territory, patrolling its surface and keeping watch for intruders whilst basking on the pool edge. There were three species that were very conspicuous, two that were red and one blue, all adult males. 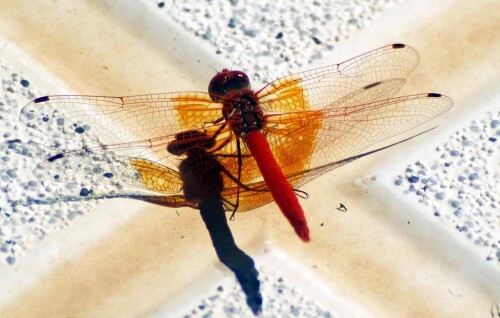 The first one to arrive was a bright scarlet red Orange-winged Dropwing (Trithemis Kirbyi) that spent quite long periods on the very edge of the pool, lifting his body vertically to into what is known as the obelisk posture. The bright sunlight cast perfect reflections of the extensive orange patches on both the fore and hind wings of the insect. 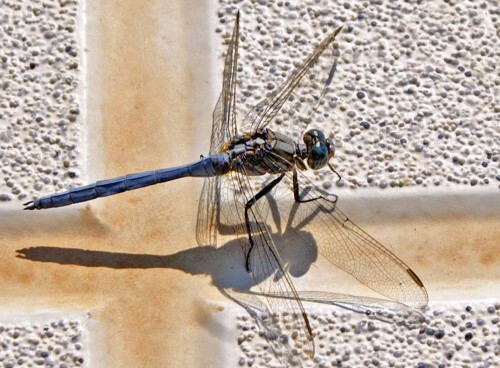 The obelisk posture is one that some dragonflies and damselflies assume to prevent overheating on hot sunny days. The abdomen is raised until its tip points at the sun, minimizing the surface area exposed to solar radiation. When the sun is close to directly overhead, the vertical alignment of the insect’s body suggests an obelisk. The Orange-Winged Dropwing is an African species which over the last few years has begun to establish itself in Southern Spain. 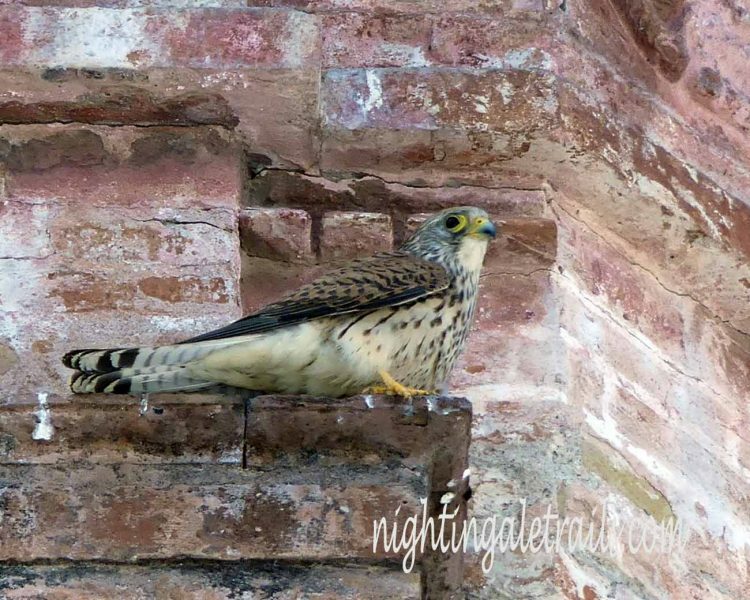 Adult length is 3.2-3.6 cm; wingspan 5.8 cm. The males are virtually all red, apart from black pterostigma, the blue-grey lower half of the eye, and the very large orange wing patches. The female has a similar wing patch, but its size is more variable than in males and the base colour is yellow, as it is in immature males. One of the most common African dragonflies, its natural habitats are various; subtropical or tropical moist lowland forests, dry savanna, moist savanna, subtropical or tropical dry shrubland, subtropical or tropical moist shrubland and rivers. Wandering around the garden I was attracted to the dragonfly in the following photograph when I spotted something glittering in the sunlight: it was perched on a lavender flower and stayed there for some time. It was clearly a ‘fresh’ specimen an immature male, I think, although females are similar to this. The Orange-winged Dropwing had the ‘territory’ to himself for a week or so, but then two individuals of different species arrived on the scene and also became very regular visitors. 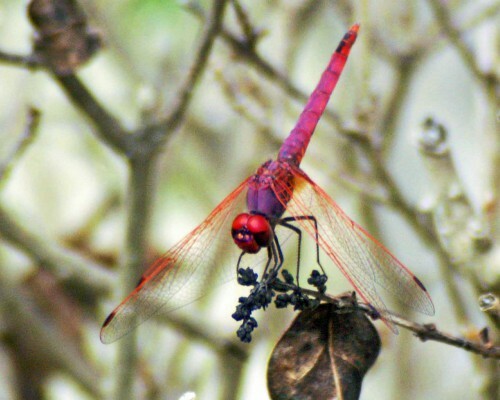 One of these was also red coloured, but a darker red with purplish shading whose common English name is Violet Dropwing (Trithemis annulata). The other a powdery-blue Epaulet Skimmer (Orthetrum Chrysostigma). 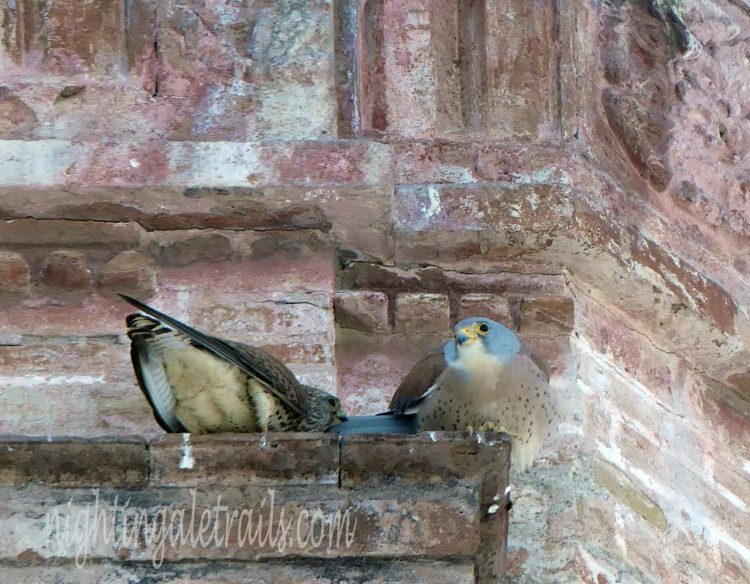 The behavioural dynamic between the three males was interesting. The Orange-winged Dropwing was always the first to appear, then later the Violet Dropwing and the Epaulet Skimmer would arrive in the garden at virtually the same time and settle themselves in positions on the edge of the pool, sometimes virtually next to one another. There was no sign of any aggression or territorial disputing between them at all. However, the Violet Dropwing did chase the slightly smaller Orange Dropwing whenever it flew out over the water or generally got too close. 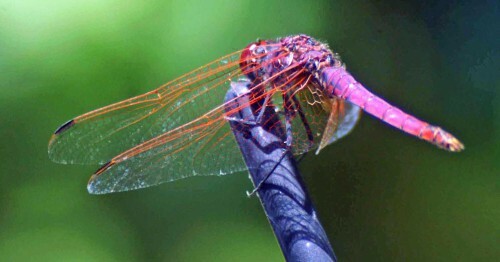 The adult male Violet Dropwing has a blue pruinescence overlying a scarlet body that creates a purplish-violet colour that is unlike that of any other dragonfly in Europe. Adult length is 3.2-3.6 cm wingspan: 60 mm (2.4 in). 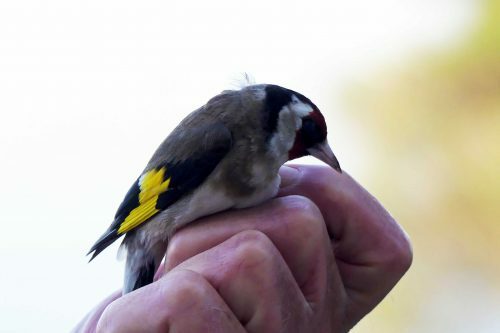 The mature male has a dark red head and a yellow labium with brown central spot. The eyes are red with white spots on the rear edge, and the frons is dark metallic purplish-red. 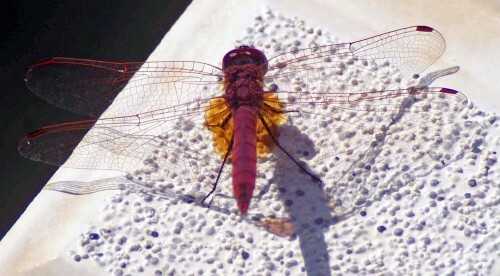 The wings have distinctive red veins, the pterostigma is orange-brown and there is a large orange-brown splash at the base of the hind wings. The abdomen is fairly broad and is pinkish-violet, with purple markings on the top of each segment and blackish markings on the terminal three segments. Females are a similar size to males but the thorax is brownish and the abdomen is yellow with dark brown markings. 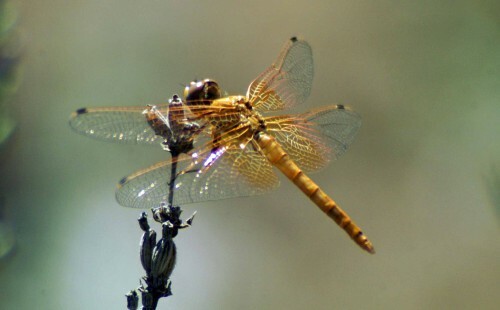 The wings of females lack the red veins of males but have similar orange-brown patches. 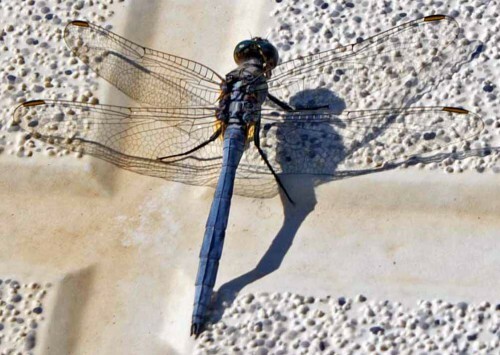 Longer established in Iberia than the Dropwings, the Epaulet Skimmer is one of a number of dragonfly species where the mature male is predominantly blue and the female/immature male is predominantly a tan/brown colour. The wings have a reddish-brown costa and brown pterostigma. 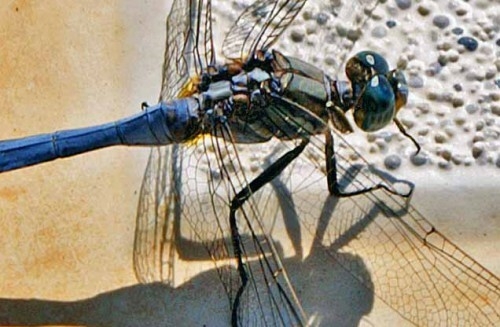 The Epaulet Skimmer is widespread throughout the Sahara region in Africa; it’s larvae are able to survive in moist sand, suggesting that it is an insect very well adapted to surviving in an arid landscape. 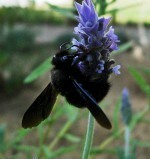 The Epaulet skimmer is unique amongst the Skimmers occurring on the Iberian peninsula in having a single white stripe or “epaulet” outlined in black on each side of the thorax, which is just about visible in the enlarged photograph below. length: 39 to 46mm flight period in Iberia: late March to mid December habitat: marshes, streams, & pools in open terrain, plus man made water bodies distribution: Southern Portugal & Spain, North Africa & the Near East. Not uncommon in southern Portugal and Spain, currently absent from the north of the Iberian peninsula, but perhaps expanding it’s range in that direction. 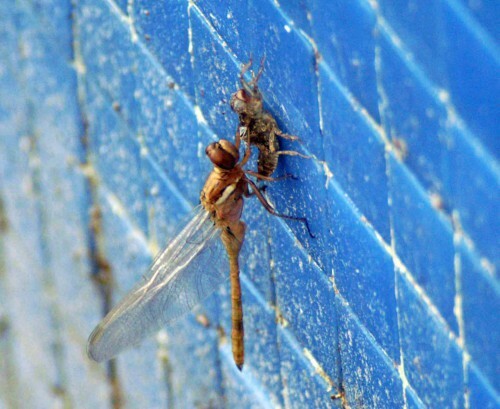 A week or so after the arrival of the three adult males described above I began also to notice cast-off dragonfly larval ‘skins’ stuck to the inner walls of the swimming pool. Each morning there would be a few more, but several days passed before I was out early enough to witness a dragonfly still preparing for its first flight. I believe it was an Epaulet skimmer as it had the distinctive white stripe on its thorax. I am relieved that all the new dragonflies emerged and set off into the world before the swimming pool was emptied and cleaned and rather wished it could have been left as a pond. 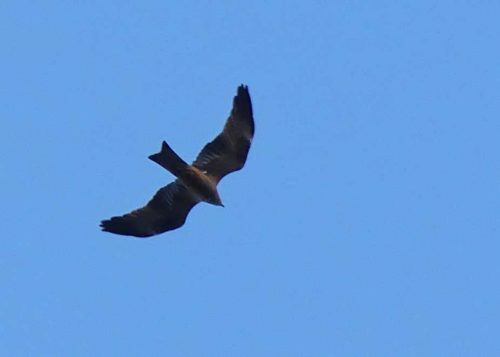 The presence in Southern Spain of all three species described above is now sufficiently established for them to be included on many species lists for the area and their ranges are extending year on year.